Before the Age of the Dinosaurs came the Age of the Amphibians, when frogs (or their larger ancient ancestors) ruled the earth. It would have been a friendly world for amphibians, full of swamps in which were formed many of the coal beds we exploit today. In this chapter, we will look at the earliest fossil-bearing formations of the Jemez area. Bryozoans, mollusks, and crinoids, oh my! The most recent eon of time is the Phanerozoic, which dates back to about 540 million years ago. The Phanerozoic, in turn, is divided into the Paleozoic, Mesozoic, and Cenozoic eras. Each of these eras is divided, in turn, into a number of periods. The Paleozoic, which covers the time period from about 540 million years ago to about 252 million years ago, is divided into the Cambrian (560-485 Ma), Ordovician (485-443 Ma), Silurian (443-419 Ma), Devonian (419-359 Ma), Mississippian (359-323 Ma), Pennsylvanian (323-299 Ma), and Permian (299-252 Ma) periods. Most geologists outside the United States combine the Mississippian and Pennsylvanian into a single Carboniferous period; since we are looking at a region in the United States, we will use the Mississippian-Pennsylvanian nomenclature. These time periods are tabulated here. The Cambrian is the earliest geological period in which there were abundant hard-shelled animals to leave fossilized remains. Earlier fossils exist, but it was some time before their nature and antiquity was recognized. In addition, in many parts of the world, the Cambrian is underlain by older crystalline rocks containing no fossils. 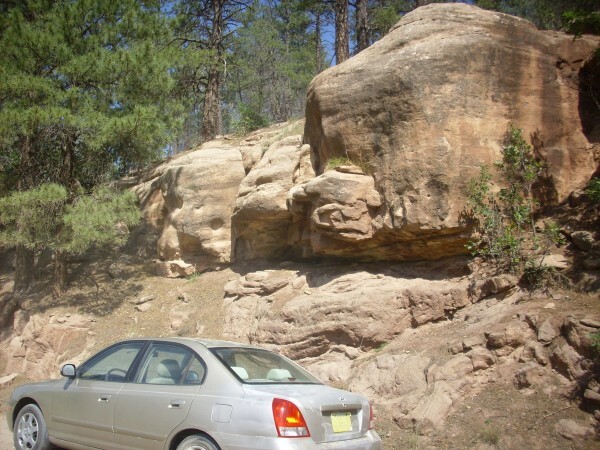 We discussed these Precambrian rocks in the Jemez area in the previous chapter. Across most of North America, the boundary beneath the Cambrian is not a mere transition to older rock beds. The boundary is unconformable, meaning that the beds above it do not appear to be a continuation of the beds below it. This indicates that the rocks of Cambrian age or later were laid down on a surface eroded into the older rocks. This also means that there is a considerable length of geological time, sometimes over a billion years, between the sedimentary beds and the Precambrian rocks beneath them. This missing period of time was first recognized in New Mexico by the brilliant geologist, John Newberry, during the Ives expedition of 1857-1858, a full twelve years before it was recognized by John Westley Powell in the Grand Canyon. It is so distinctive and so widespread across North America that it has been dubbed the Great Unconformity. The Great Unconformity is beautifully visible at Cody, Wyoming, where the gap in the geological time record is over 2 billion years. Beds of the 515 million-year-old Flatstone Sandstone sit unconformably on 2.7 billion-year-old Archean rocks. The sandstone is a tan color while the Archean rocks are mostly fine-grained gray granite intruded by ribbons of coarser pink granite. The Archean rocks date back to a time when the Wyoming-Montana area was not yet a part of North America, but instead was either part of a different continent or a small continent in itself. 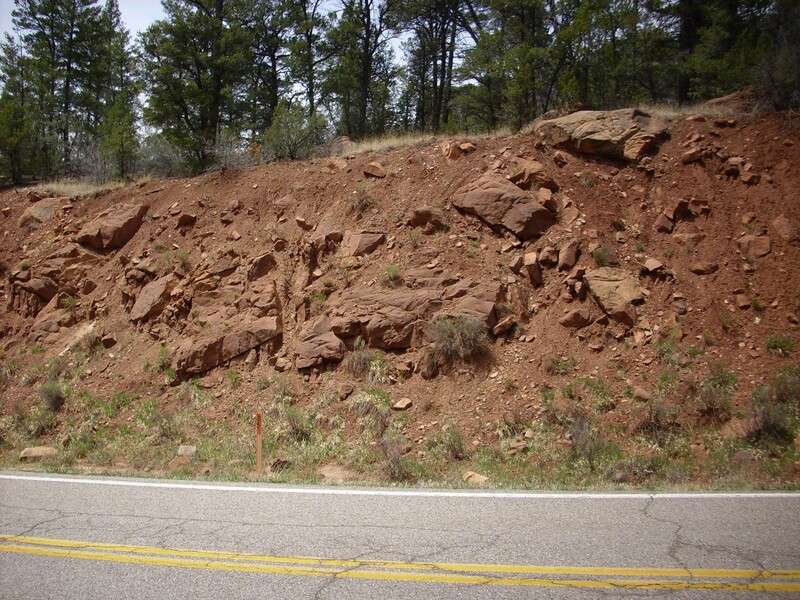 Though widespread, the Great Unconformity is not identical everywhere. For example, outcroppings of Cambrian to Devonian rocks are present only in the southern part of New Mexico. Throughout most of the rest of the state, including the Jemez area, rocks of Mississippian age or later sit directly on Precambrian rocks. A prominent exposure of the Great Unconformity is seen at the top of Sandia Crest, east of Albuquerque. Here Pennsylvanian sandstone of the Sandia Formation sits atop 1.43-billion-year-old Sandia Granite. This can be admired more closely on the road to the crest. This is one of the best exposures of the Great Unconformity I’ve seen. The Sandia Granite is overlain by 310-million-year-old Sandia Formation. The contact represents some 1.1 billion years of missing geologic history, eroded away prior to 310 million years ago. Since the only Precambrian outcropping in the Jemez proper is at Soda Dam, this is also the only place in the Jemez where one can see the Great Unconformity. We visited the Soda Dam area in the previous chapter, but it's time to visit the area again. To the east of Soda Dam, the rocks sitting on top of the Precambrian gneiss are red beds of the Mississippian Log Springs Formation. To the west of the dam, just across the highway, the geology is confused by the presence of a strand of the Jemez Fault and by extensive deposits of relatively young travertine. The fault itself is well exposed part of the way up the canyon wall. The fault is the yellowish, steeply tilted zone just above the center of the photograph. We will have much to say about faults later in this book, but for now it suffices to say that a fault is a fracture in the earth's crust across which the rock beds are displaced vertically, horizontally, or both. 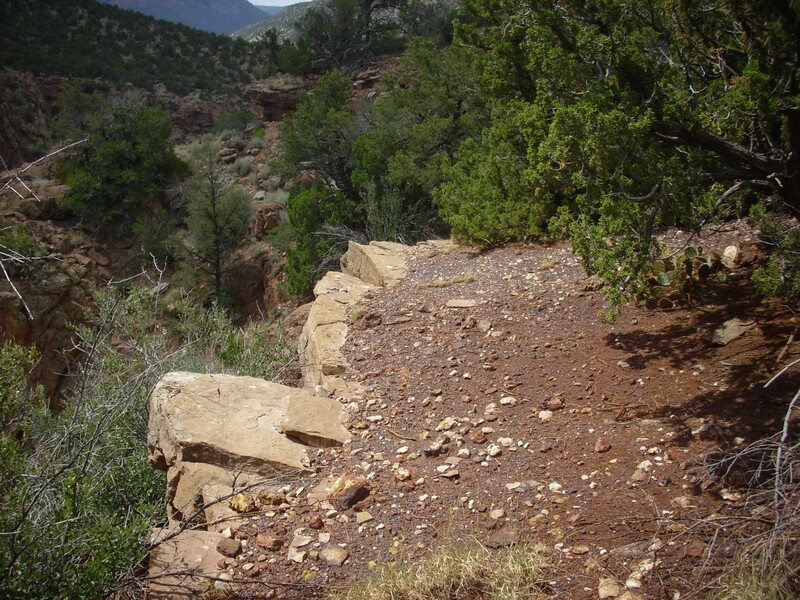 The Jemez Fault displaces the rocks mostly in the vertical direction and mostly with the downthrown side (the side where the rock beds are displaced downwards) to the east. 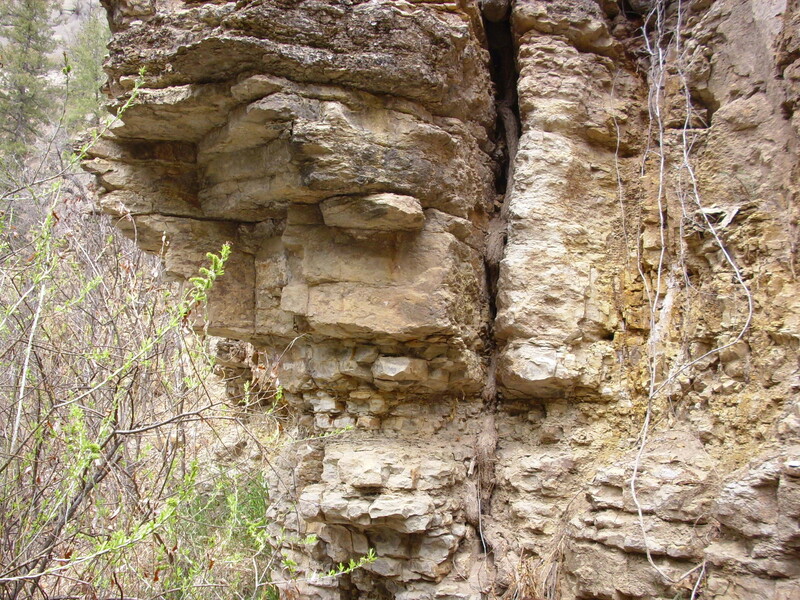 However, this strand or branch of the fault is displaced downwards to the west. To the left is Precambrian gneiss and to the right is relatively young travertine deposits of Soda Dam. The travertine sits on top of Pennsylvanian Sandia Formation, but the two are quite difficult to distinguish since they are both limestone. To the left of the fault, however, there are intact Mississippian limestone beds sitting atop the gneiss, representing another exposure of the Great Unconformity. The Mississippian beds are visible at center left, forming thin beds tilted to the left. These are probably part of the Arroyo Peñasco Group. To the right is Jemez Cave, and the jumbled formations above the cave are geologically young travertine deposits. 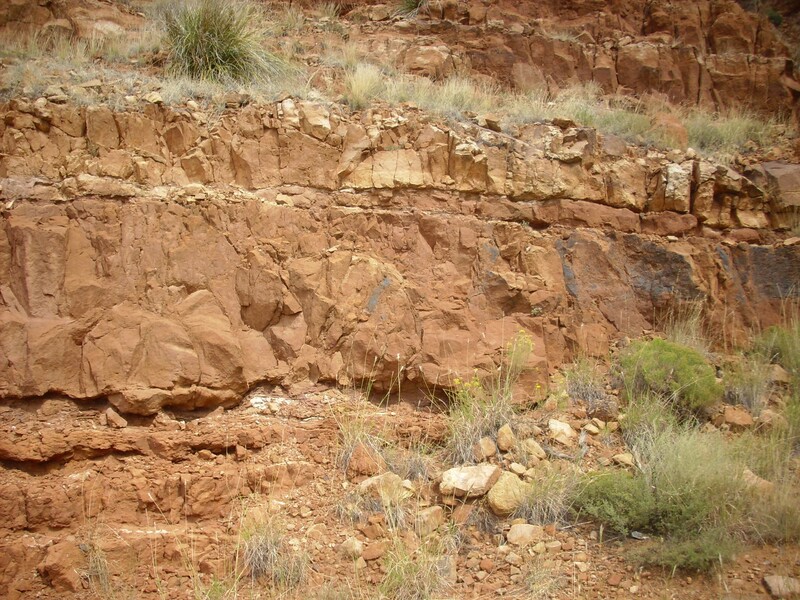 North of the Guadalupe Box, there is another exposure of the Great Unconformity. The lower part of the photographic is Precambrian monzonitic gneiss. Laid down on top of it are beds of Mississippian Arroyo Peñasco Group. The youngest Proterozoic formation of the Jemez is the Joaquin Granite at 1.424 billion years. The Arroyo Penasco Formation is about 330 million years in age. 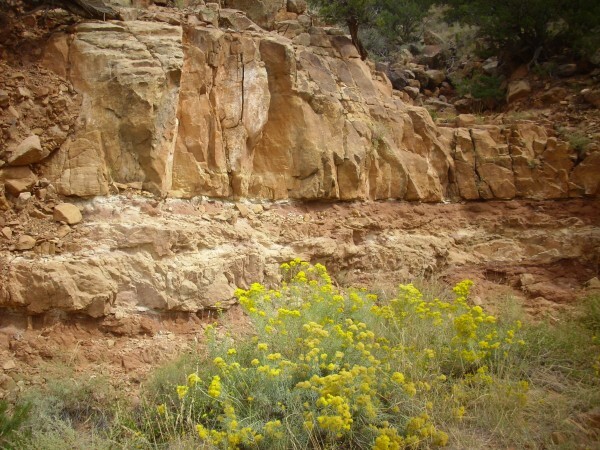 Thus some 1.09 billion years is missing from the geologic record in the Jemez region. We must look elsewhere for clues to what was taking place in the Southwest during this "Boring Billion." The supercontinent of Columbia began to break up shortly after accreting the Yavapai and Mazatzal Provinces. This breakup had relatively little effect on New Mexico, unless the heating event at 1.4 billion years was related in some way. However, A-type granite does not have the composition geologists expect for magma associated with continental rifting. A new supercontinent, Rodinia, began assembling around 1.1 billion years ago, and mountain building associated with continental collisions took place in west Texas. 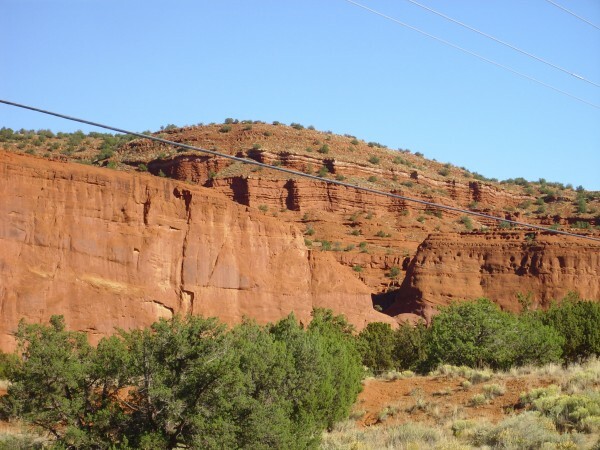 The most likely consequence for the Jemez area was to raise the area above sea level and erode away any rocks younger than 1.4 billion years. There are a couple of proposed reconstructions of the geography of Rodinia. Both place Australia and East Antarctica along the west coast of Laurentia, but one model has Australia far to the north and East Antarctica directly west of the Jemez while the other has Australia directly west of the Jemez and Antarctica to the south. Most place Africa to the southeast and attribute the mountain building in west Texas to the collision of Africa with North America. The timing of the breakup of Rodinia can be estimated from paleomagnetism. When magma solidifies, any magnetic minerals in the rock will be aligned with the Earth's magnetic field. Unless the rock is subsequently heated above a certain temperature, its Curie temperature, this remanent magnetization remains unchanged for up to hundreds of millions of years. Geologists can measure the remanent magnetization of a rock sample and estimate the strength and orientation of the Earth's magnetic field at the time of its formation. Such paleomagnetic measurements show where the rock was relative to the Earth's magnetic poles. Paleomagnetic measurements in Australia and North America are consistent with the continents lying side by side up to about 770 million years ago. At this time, the locations of the continents begin to diverge, suggesting that Australia had broken away from North American to produce the paleo-Pacific, or Panthalassic, Ocean. The breakup of Rodinia around 750 million years ago, the reassembly of the continents into the supercontinent of Pannotia between 600 and 550 million years ago, left no traces in northern New Mexico. The nearest rocks that record this long interval of the Earth's history belong to the Grand Canyon Supergroup found in the lower portions of the Grand Canyon of Arizona. These date back around 1.35 billion years. The period from 1.1 to 0.6 billion years ago is particularly poorly recorded throughout the American Southwest. But, during this long time interval, Laurentia drifted into the southern hemisphere; sexual reproduction appeared, around 1.2 billion years ago; multicellular life became more common; and, towards the end of the Proterozoic, the first true animals appeared. This period includes the Varangian glaciation, the worst ice age the Earth has known. Photosynthesis had drawn down the amount of warming carbon dioxide in the atmosphere, and the location of Rodinia, astride the equator, meant that the Earth's dry land was positioned to reflect the maximum amount of solar energy. The breakup of Rodinia exposed great new masses of rock to weathering, which drew down carbon dioxide further. This triggered a climate runaway, as glaciers spread across the globe, reflecting more solar energy into space and cooling the Earth further. Eventually most of the Earth was covered with great ice sheets. Evidence of glaciation has been found on every continent for this time period, including areas that seem to have been close to sea level near the Earth's equator. Glacial till, a characteristic sedimentary deposit produced by glaciers, is preserved in parts of Utah from this time period. This was deposited offshore in the newly opened Panthalassic Ocean. This glaciation may have helped scour off younger sedimentary beds across the Southwest. The "snowball Earth" scenario remains controversial. There are alternate explanations for some of the evidence, and a poorly explained mystery: How did life on Earth ever recover from so extensive a glaciation? Whether due to glaciation or more conventional erosion, a vast area of western North America was beveled nearly flat, forming a peneplain. Geologists mapping the remnants of this peneplain find less than 10 meters (30') of relief, with only very low ridges of slightly more resistant quartzite breaking the perfectly level surface. 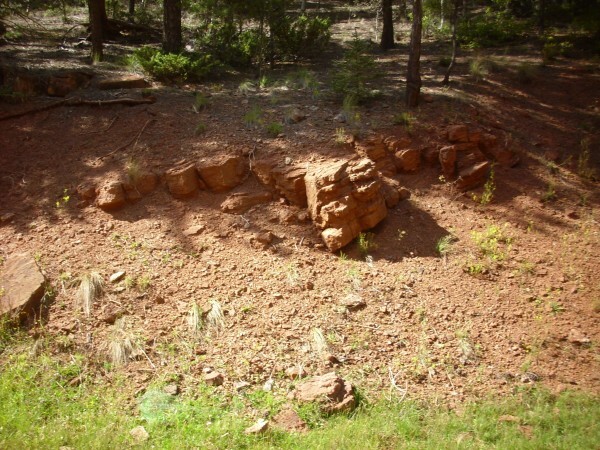 Though the geologic record of this period in the Southwest is fragmentary, one geologic event during this time period did leave its mark on the Jemez area. Here are a couple of pieces of Precambrian basement rock collected from a spot northeast of Santa Fe, along the Hyde Park Road. The rock on the right is the predominant rock in the road cut. It is a fairly unremarkable granite gneiss, though attractive enough that it's used for decorative gravel throughout the region. It resembles the gneiss from Soda Dam. The rock on the left is from the biotite schist that was intruded by the granite gneiss. There's more to these rocks than meets the eye. The fractured surfaces, which my photos cannot do justice to, are actually quite ancient. These distinctive fractures, which are even more striking in the original outcropping, are called shatter cones, and they are an indication that the rocks were very close to a meteorite impact event. This is confirmed by findings of shocked quartz in the area. This Santa Fe impact structure is of moderate size, not more than a few kilometers in diameter, and took place long enough ago that the crater has long since been eroded away, leaving only the deep rocks that were under the center of the crater. It is possible that some of the shattered rock produced by the impact was preserved. About three kilometers (two miles) to the west, at Nun's Corner, layers of dolomite of the Mississippian Arroyo Peñasco Group sit on top of Precambrian granite. The granite is highly fractured, almost rotten in texture, suggesting it is breccia (shattered rock) produced by the impact. How long ago did this impact occur? The Precambrian granite here is between 1.6 and 1.7 billion years old. Geologists have found no trace of shatter cones or shocked quartz in the overlying younger rocks, which are about 350 million years old. So the impact occurred sometime between 1.6 billion and 350 million years ago. In other words, we can't constrain it very well. This was probably not a major impact event. The area over which shatter cones and breccia are found is not large, though tectonic activity over the millions of years since the impact have probably erased many of the traces. But it's the only impact event discovered so far in the Jemez area. 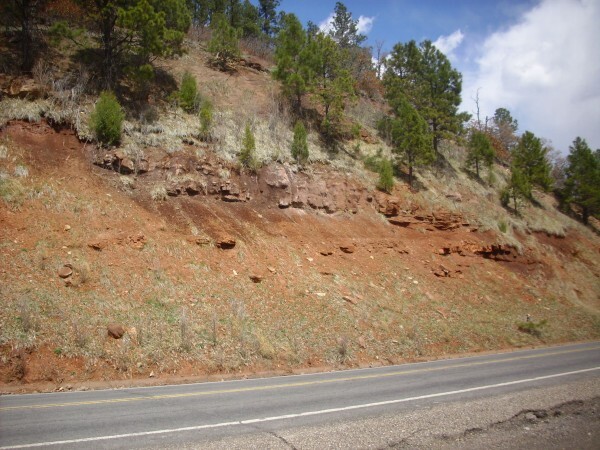 The gap represented by the Great Unconformity in the Jemez is from about 1.4 billion years ago, in the Mesoproterozoic Era, to about 340 million years ago, in the Mississippian Period. Some 1.06 billion years of geologic history have been erased. During this long interval, the oxygen levels in the atmosphere rose to about the level of today; eukaryotes proliferated and the first vascular plants, arthropods, fish, and amphibians appeared in the fossil record; and vascular plants and amphibians colonized dry land. This seems to have been a long period of stability for northern New Mexico, which was little touched by the formation and breakup of supercontinents as it was eroded flat. With the breakup of Pannotia, much of the Earth's crust became covered with shallow oceans in which the rocks of the Cambrian and succeeding periods were deposited. Northern New Mexico remained an area of higher elevation, part of a structure geologists have dubbed the Transcontinental Arch. This extended to Wisconsin and beyond. The Transcontinental Arch did not become submerged until later, and the Jemez area remained above water until the Mississippian. Following the Mexican-American War of 1847, the United States took control of a vast stretch of territory from the Rio Grande to the Pacific Coast, including the future states of California, Nevada and Utah and much of Arizona, New Mexico, and Colorado. This included the Jemez region. The U.S. government was eager to build a transcontinental railroad across the new territory. Congress funded surveying expeditions to explore possible routes for railroads, including a route roughly along the 35th parallel. Attached to this survey was a French geologist, Jules Marcou. Marcou had been trained by the pioneering geologist, Jules Thurmann, and assisted in mapping the Jura Mountains of France. He was later introduced to Louis Agassiz, and joined Agassiz in the U.S. in 1847. Marcou studied the geology of the Michigan copper mines, the states of New Jersey, Virginia, and Pennsylvania, and Mammoth Caves in Kentucky. He had also traversed Canada and published an early geologic map of North America. Though parts of New Mexico had previously been studied by officers of the Corps of Topographic Engineers, who often had a surprisingly good background in the natural sciences and made perceptive observations, Marcou was the first trained geologist in the territory. The Marcou Survey of 1853 passed through Santa Fe, Cerrillos, and Algodones on its way to Albuquerque, where the expedition paused to refit. Marcou took advantage of the delay to explore the Sandia Mountains, and his attention was drawn to the thick beds of limestone capping Sandia Crest. Geologists of his day were particularly interested in fossils, and Marcou immediately recognized characteristic fossils of the Carboniferous in the limestone. He also discovered several new fossil species. 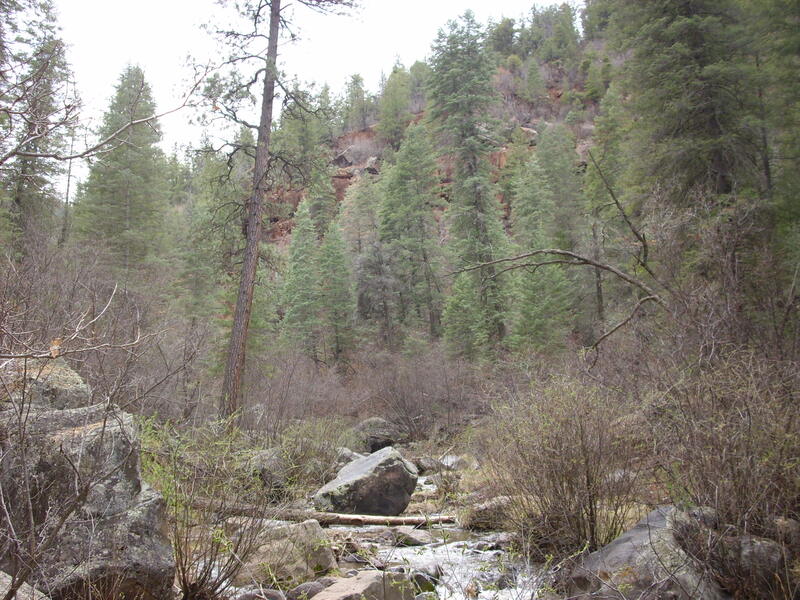 The expedition then headed southwest from Albuquerque, and Marcou seems not to have personally explored the Jemez. The geologic map produced from his notes is understandably most accurate immediately along his route. 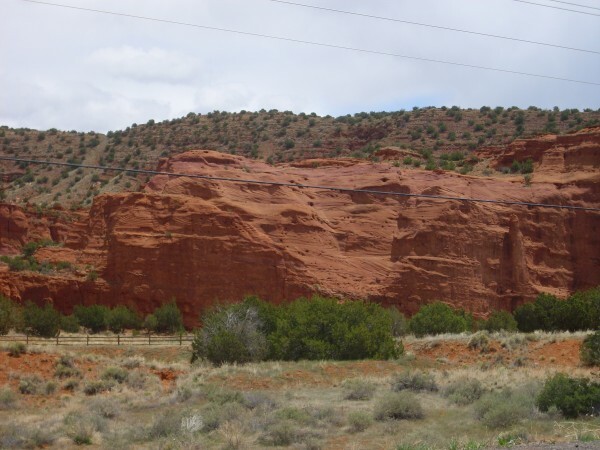 It correctly identifies Santa Ana Mesa and the Cerros del Rio as geologically young volcanic formations, but the Jemez is mapped as a simple north-south range with a granite core surrounded by Carboniferous rocks and red sandstone on all sides. 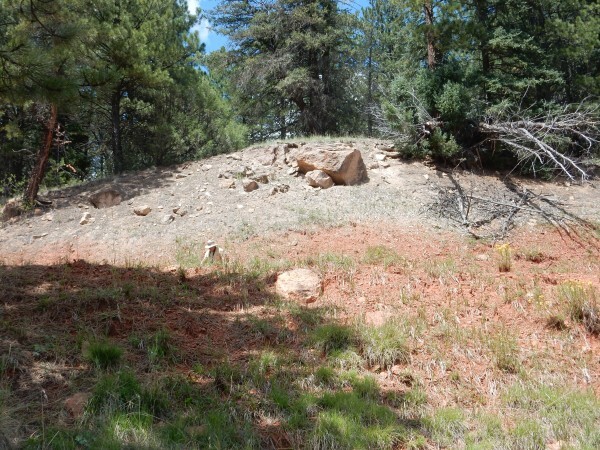 This was nonetheless the first report from a trained geologist passing near the Jemez region, and Marcou was certainly correct in identifying some of the beds in the Jemez as carboniferous, even if he was mistaken on their extent. It seems a shame he did not explore Canyon de Guadelupe and Canyon de San Diego personally, and thus missed discovering some of the richest beds of brachiopod fossils in North America. Relief map of the Jemez with Mississippian and Pennsylvanian outcroppings highlighted in red. 345 million years ago, during the Mississippian Subperiod, northern New Mexico was a subtropical sea studded with islands. To the east lay most of the Earth's continental crust, which was assembling into a new supercontinent, Pangaea. The narrow Rheic Ocean separated North America from South America and Africa, which had already fused with Australia, Antarctica, and India to form a large continent which geologists have named Gondwana. Europe, Siberia, and central Asia had fused with North America to the east and northeast to form Laurasia, and only China remained isolated, separated from Laurasia and Gondwana by the Paleo-Tethys Ocean. This was a time of low relief and very high sea levels. Like New Mexico, most of Laurasia was flooded with shallow seas. Only in eastern Canada, New England, and Scandinavia were large areas of dry land exposed,. While much of central Gondwana was dry land, the margins of the southern continent were also flooded by shallow seas. Shallow seas covering continental crust are called epicontinental seas. Geological history shows a repeated pattern of fluctuating sea levels. Sea level today is somewhat higher than has been typical of the Cenozoic, the most recent era of geologic time. All of written human history has taken place during an interglacial, a period of relative warmth between glaciations. The oceans today are high enough to flood the margins of the continents, forming continental shelves under shallow water in the North Sea, the Bering Strait, and elsewhere. (The North Sea is thus a modern example of an epicontinental sea.) The continents were almost entirely above water, with very little submerged continental shelf, during the peaks of the ice ages. But even the continental shelves of today are small compared with what they have been in the geological past: The Cenozoic has been a period of unusually low sea levels. Geologists believe that during times of rapid mid-ocean rifting, the hot, buoyant oceanic crust produced at highly active mid-ocean ridges displaces enough ocean water to flood the continents. The Mississippian and Pennsylvanian was a time of such continental flooding. The advance of the shoreline into the continental interior is called a transgression; the subsequent retreat of the shoreline off the continent is called a regression. The transgression that drowned the Jemez area during the Mississippian is known as the Kaskaskian transgression. In Europe, the Mississippian and Pennsylvanian subperiods are jointly called the Carboniferous Period, because there were vast and long-lived swamps in which a great deal of peat was laid down that eventually became coal. 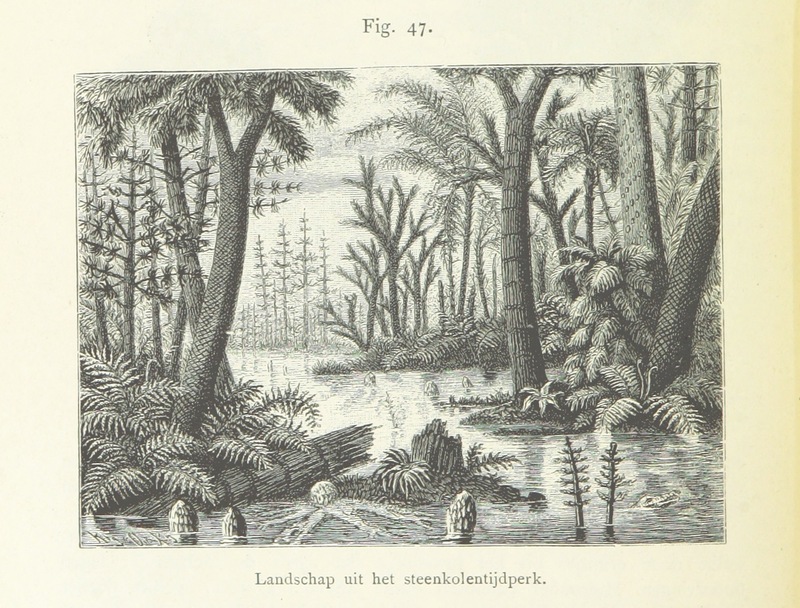 The vegetation of the swamps was dominated by lycopsids (giant relatives of club mosses) such as Lepidodendron and early seed plants such as Glossopteris. New Mexico was not one of these areas; most of the state was under salt water, in a shallow marine environment, and most of the rock laid down during this period was limestone and shale. The coal swamps were populated by amphibians, of which the largest exceeded two meters (six feet) in length. Large insects and other arthropods first appeared in great numbers in the Pennsylvanian, thriving in the humidity and in oxygen levels 60% higher than today. 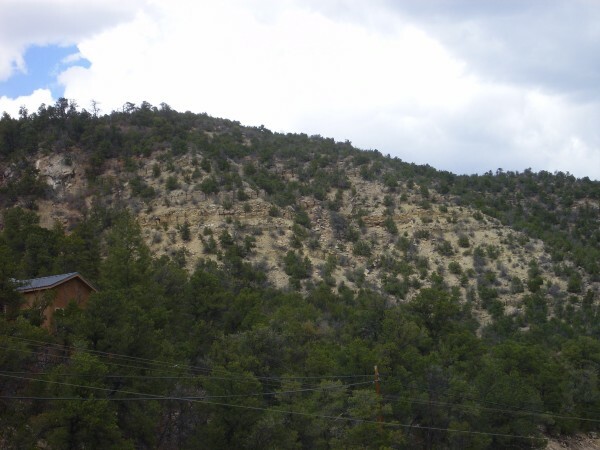 The Carboniferous formations of the southwest Jemez are nowhere better seen than from atop the western rim of Guadalupe Box, which can be reached by a short if strenuous hike along a fire road. To the right is the mouth of Guadalupe Box, with Mesa Garcia in the distance. Tall cliffs of Precambrian gneiss form the Box. Atop the gneiss are Mississippian beds of the Arroyo Peñasco Group, forming a thin layer that dips with the gneiss to the north (left in photograph) before pinching out. Atop this is a spotty layer of red sediment of the Log Springs Formation, then a a thick layer of Osha Canyon Formation. On top of the Osha Canyon Formation is the Sandia Formation, whose lowermost hard sandstone beds form the knob in the center of the panorama. At far left is an unnamed canyon descending from the north end of Guadalupita Mesa into the valley of the Rio Guadalupe. The Osha Canyon Formation is visible in the wall of this canyon, overlain by Sandia Formation. Sandia Formation also underlies the lower part of Guadalupita Mesa on the skyline. Above the Sandia Formation on the northern (left) slopes of Guadalupita Mesa, and below the cap of Bandelier Tuff, are white slopes of the Madera Formation. 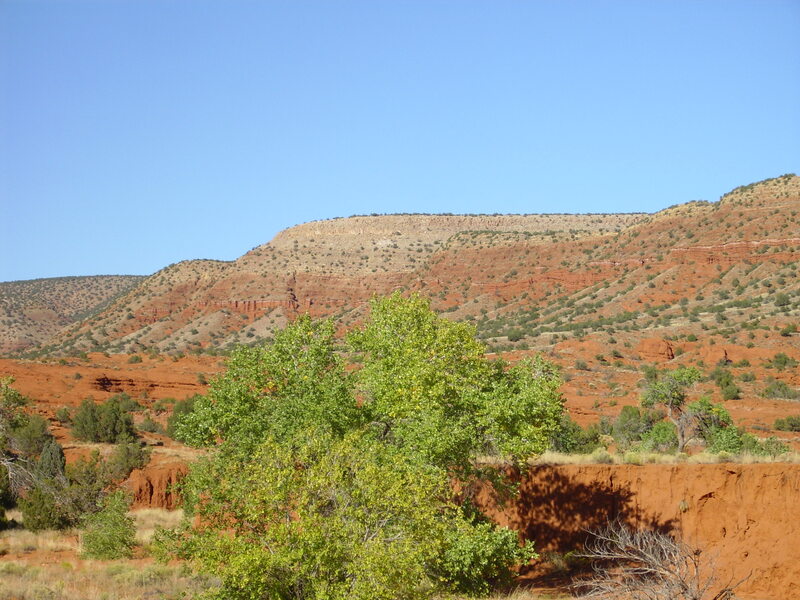 The red beds on the southern (right) slopes of Guadalupita Mesa are Permian formations that we will examine more closely later. In 1944, an oil and gas survey led by C.B. Read noted that the lowermost Paleozoic beds in northern New Mexico consisted of marine limestone, which they mapped as the lower limestone member of the Sandia Formation. In 1955, A.K.Armstrong proposed that these beds be promoted to formation rank as the Arroyo Peñasco Formation. By 1967, Armstrong had realized that the Arroyo Peñasco Formation was equivalent to the Espiritu Santo and Terrero Formations in the Sangre de Cristo Mountains, and the Arroyo Peñasco was promoted to group rank. Relief map of the Jemez with Arroyo Peñasco Group outcroppings highlighted in red. 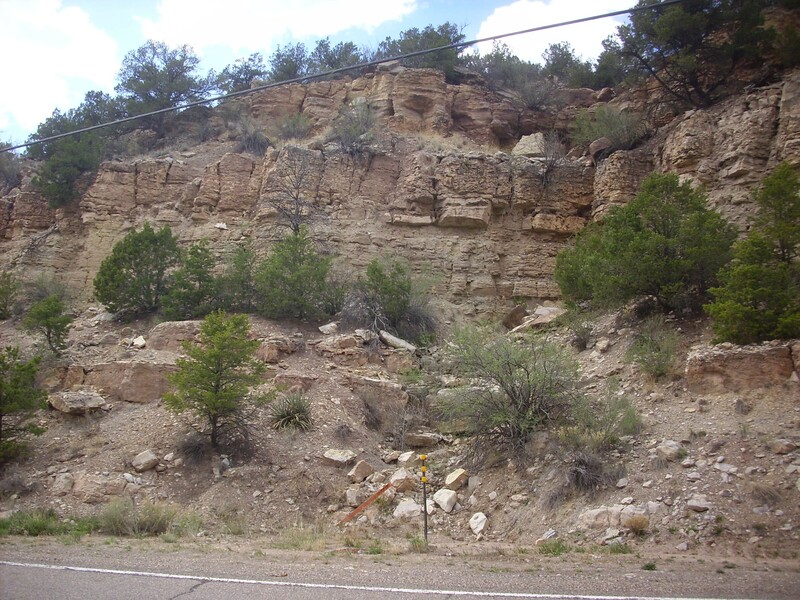 The Mississippian Arroyo Peñasco Group is the oldest Phanerozoic sedimentary unit in northern New Mexico. 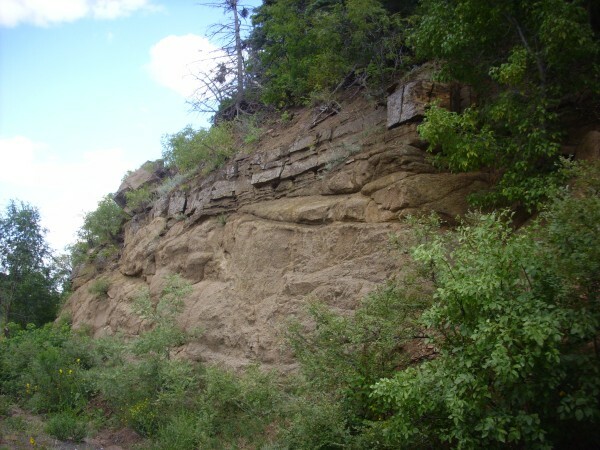 It is not found everywhere in the region, and it shows evidence of having itself been weathered and eroded in many places before being buried under Pennsylvanian sediments. 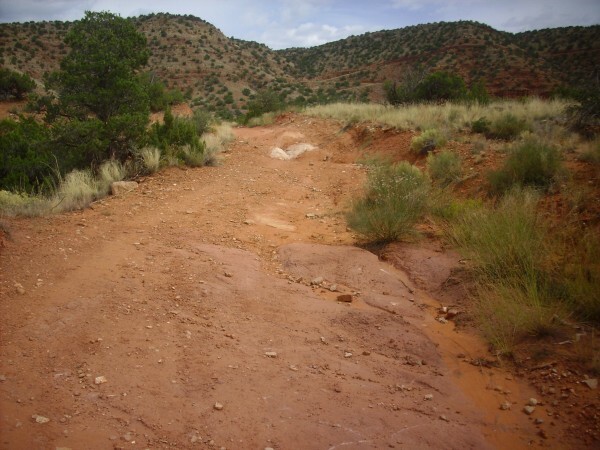 The Arroyo Peñasco Group was deposited on the Precambrian peneplain beginning around 345 million years ago, when southern and central New Mexico was covered by a shallow sea whose shoreline moved back and forth across the Jemez area. 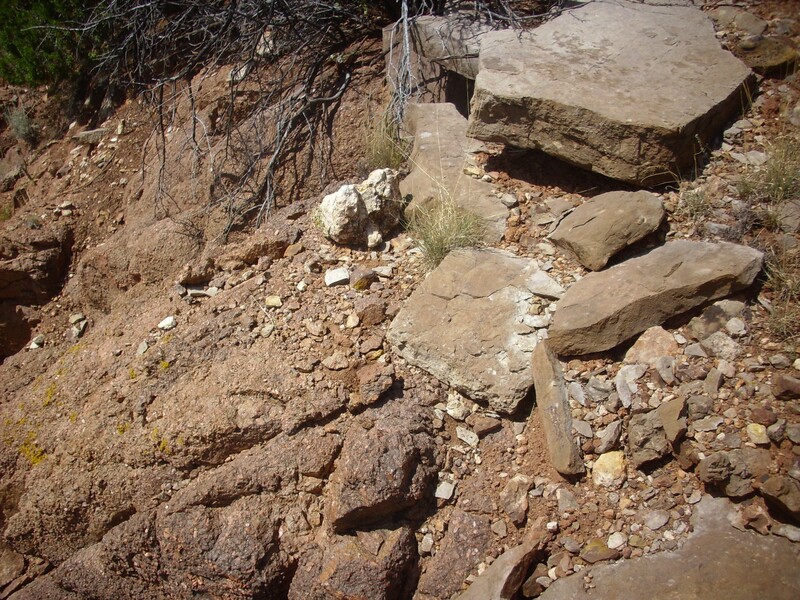 There is little conglomerate in the lower beds of the Arroyo Peñasco Group, which tend instead to be fairly clean sandstone of the Del Padre Sandstone Member of the Espiritu Santo Formation. This indicates an absence of any high ground to shed coarse sediments into the advancing ocean. Further west, this sea deposited the Redwall Limestone of the Grand Canyon area. The upper beds of the Arroyo Peñasco Group (Terreri Formation) are also largely limestone, deposited in a shallow marine environment. We've seen several examples earlier, showing thin beds of the group atop the brecciated granite near the Santa Fe impact structure and the gneiss at Soda Dam and Guadalupe Box. One can more closely examine the Arroyo Peñasco Group at Guadalupe Box by crossing the Rio Guadalupe and hiking a fire road east of the river to the top of the east rim of Guadalupe Box. Adventurous readers are advised that the Rio Guadelupe has no bridges or easy fords in this area and can be swift and deep; it should be crossed with caution. This photograph shows a thick bed of limestone of the Arroyo Peñasco Group overlain by a thin layer of Log Springs Formation. These beds lie directly on top of Precambrian gneiss, showing that the Del Padre Sandstone Member is not present here. During the Mississippian, momentous events were taking place far to the west of the Jemez. At that time, the western coast of North America was located in what is now central Nevada. The continental margin here had been passive since Australia split away from North America during the breakup of Rodinia, about 770 million years ago. Although the geological record is incomplete, the weight of evidence is that the oceanic crust beyond the edge of the continent began subducting under an island arc or small continent further out in what is now the Pacific, and in the early Mississippian the North American continent itself drifted into the subduction zone. This began a pattern of tectonic activity along the western edge of North America whose effects have continued to the present day. Because continental crust is too buoyant to subduct, the arrival of North America at the subduction zone "jammed" the subduction zone. This had two effects. First, the island arc or microcontinent under which ocean crust has previously subducted to the west became fused to the western edge of North America. Second, the subduction reversed itself; oceanic crust from further west began subducting to the east under North America, whose western margin became a destructive margin. The collision threw up a substantial range of mountains, an event called an orogeny. In this case, geologists have dubbed it the Antler Orogeny, after Antler Peak, Nevada, a modern mountain whose underlying rocks included thick Mississippian conglomerate beds. These could only have been shed from a high mountain range, and they provided the first clues to the event. Limestone is a sedimentary rock composed mostly of the mineral calcite, CaCO3. Most limestone consists of tiny fragments of the shells of marine organisms, mixed with variable quantities of sand, silt, and clay. It forms primarily in shallow marine environments, where tiny shelled organisms such as foraminifera (shelled plankton related to the amoeba) multiply in great numbers. The Arroyo Peñasco Group is rich in fossil foraminifera and microscopic algae. Calcium carbonate is soluble in deep, cold water, so it is not possible for limestone to form in waters deeper than 3000 meters (10,000 feet), and while limestone sometimes forms in fresh water, this is uncommon. Furthermore, the best shallow marine environments for limestone formation are ones in which other sediments, such as silt and clay, are scarce. This is most likely to be the case in an arid climate, where there are few rivers to carry sediments into the ocean. Extensive limestone beds suggest that the underlying tectonic plate was situated at around 30 degrees north or south latitude when the limestone formed. These are the so-called "horse latitudes", where most modern deserts are located. New Mexico is thought to have been about 10 to 15 degrees south of the equator during the Mississippian, on the edge of this latitude zone. Dolostone is a close relative of limestone and likely forms from limestone exposed to magnesium-rich fluids under the right conditions of temperature, pressure, and oxygen abundance. The magnesium replaces part of the calcium to produce dolomite, a mineral with the composition CaMg(CO3)2. The details of this process are still not entirely understood, but dolostone seems to form more readily during times of high sea level, and it is rare to find a "partial" dolostone: Carbonate rocks tend to be either almost entirely calcite or almost entirely dolomite; rocks combining both minerals are very uncommon. Limestone is easy to identify in the field. Though it is a tough rock, it is not particularly hard, so that it is easily scratched with a penknife. It sometimes displays visible calcite crystals. The surest test of all, however, is to drip some acid (such as diluted hydrochloric acid) on the rock. Limestone will foam vigorously. Dolostone resembles limestone in appearance, but is harder and bubbles only feebly when exposed to acid. Rocks composed of silicate minerals generally show no reaction to acid. Calcite, CaCO3, is one of the most common non-silicate minerals. Its crystal structure is fairly straightforward, consisting of of alternating layers of calcium ions and carbonate ions. Structure of calcite. Courtesy of Steven Dutch. In this diagram, we are looking directly down on the alternating layers of the crystal. Calcium ions are shown in purple and carbonate ions as a set of three oxygen atoms, drawn in green, blue, or yellow, surrounding a small gray carbon atom. Well-crystallized calcite is quite common, and is popularly known as dogtooth spar. Calcite crystals tend to form elongated pyramids, as in the sample at top. 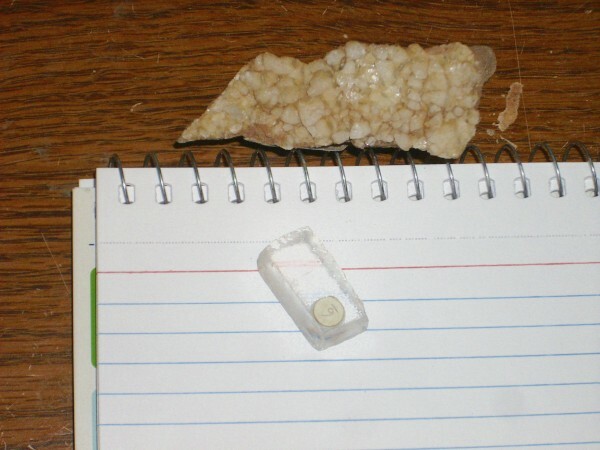 However, calcite has perfect cleavage in three directions, and so large calcite crystals break into cleavage fragments, like the one sitting on the ruled paper, that are boxy in shape. Calcite has the optical property of birefringence, or double refraction, in which images seen through clear calcite appear doubled. You can see in this photograph that the lines on the paper are doubled as seen through the crystal. Calcite is also relatively soft. It is not quite soft enough to scratch with a copper penny, but it is easily scratched with a knife. Its softness, distinctive cleavage, optical properties, and reaction with mild acids to produce bubbles are distinctive enough that calcite is easily identified in the field. In addition, calcite very typically fluoresces when exposed to shortwave ultraviolet light, glowing white, orange, or red. However, the glow is produced by impurities and so is not a completely reliable key to identification. Calcite is very slightly soluble in cool, acidic water. When limestone beds are exposed at the surface, rainwater (which is slightly acid from dissolved carbon dioxide, even in the absence of industrial pollution) can cut deep sinkholes and caverns in the limestone. This produces what geologists call a karst topography. Northern New Mexico is presently too arid for areas underlain by limestone to develop much karst topography, but this was not true in the distant past. Geologists studying sedimentary formations will often attempt to construct the paleotopography of a region at various times in the past. This starts with the obvious: Wherever there is a sedimentary bed of the particular age we are interested in, we know that the conditions that produced that kind of sedimentary rock were at work at that location at that time. So wherever we see exposures of the Arroyo Peñasco Group limestone, we know that that area was covered with a shallow sea 345 million years ago. 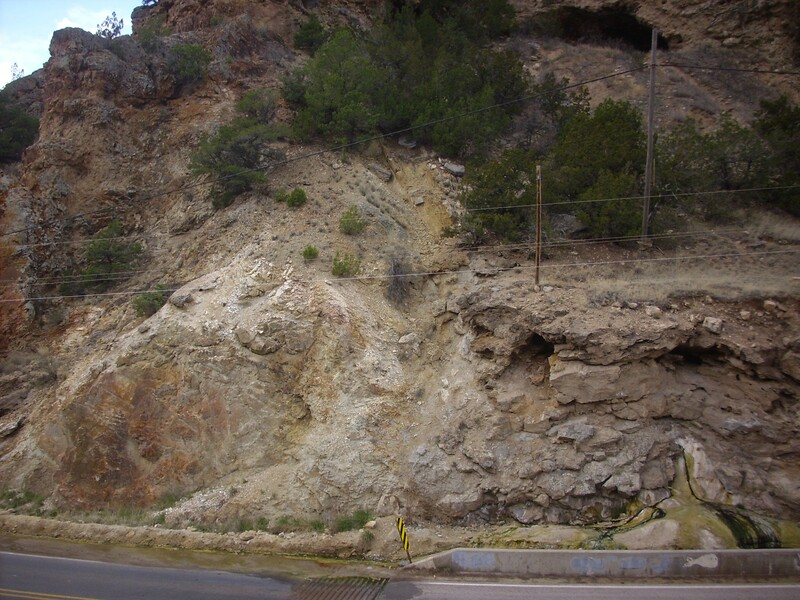 There is no other significant Mississippian formation in northern New Mexico. Can we conclude that areas lacking Arroyo Peñasco Group were high ground 345 million years ago? Unfortunately, there are three other possibilities. One that has probably occurred to you already is that most of this area is covered with beds that are younger than Mississippian age and conceal any older rocks. Unless we have reliable drilling data for these areas, we do not know whether any Mississippian rocks are located there. In principle, further drilling might someday give us that information. But there are areas where we see bare Precambrian rocks exposed, and other areas where we see rocks younger than the Arroyo Peñasco Group sitting directly on Precambrian rocks. Here we are still left with two possibilities. One is that this was high ground during the Mississippian, so that no sedimentary beds were laid down at that time. But there is also the possibility that beds were laid down but subsequently eroded away. And this could have taken place any time between the Mississippian and the age of the younger beds. The red areas are known to be shallow marine environments during the Mississippian. The green area areas that must have been above water during or shortly after the Mississippian. Everywhere else is unknown. This gives us a rather patchy picture of what took place. We'll see better examples with other formations later in the book. But we see indications that there was some high ground in the southern Sierra Nacimiento during the Mississippian. We do have another clue that most exposures of the Arroyo Peñasco Group were briefly above water towards the end of the Mississippian. Around 320 million years ago, North America collided with Africa. During this collision, a large area coinciding with parts of today's Rocky Mountains was uplifted to form what geologist Willis T. Lee, writing in 1918, called the Ancestral Rocky Mountains. The Ancestral Rocky Mountains included a highlands called Uncompahgria, stretching in a great arc from western Colorado (the Uncompahgre Uplift) down to the area just east of Santa Fe (the San Luis Uplift). 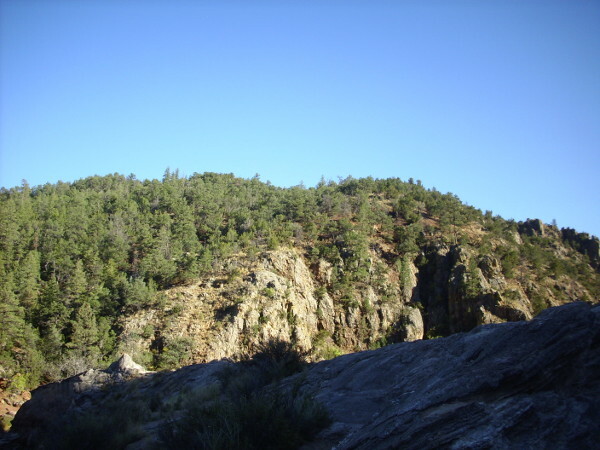 A small outlier range, the Penasco Uplift, was located in the current location of the Sierra Nacimiento. A deep basin, the Paradox Basin, formed to the southwest of Uncompahgria, with its deepest point somewhere close to the current location of Arches National Monument. The Paradox Basin followed the curve of Uncompaghria and may have reached as far as the present location of the Jemez Mountains. The collision also produced a brief lowering of sea levels that separates the Mississippian from the Pennsylvanian in northern New Mexico. 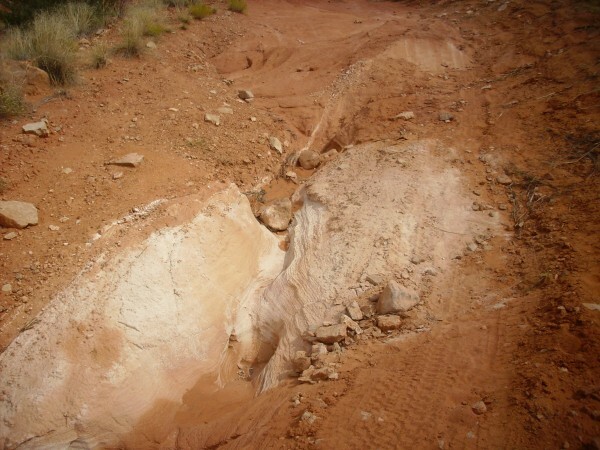 During this time, northern New Mexico was again eroded nearly flat. 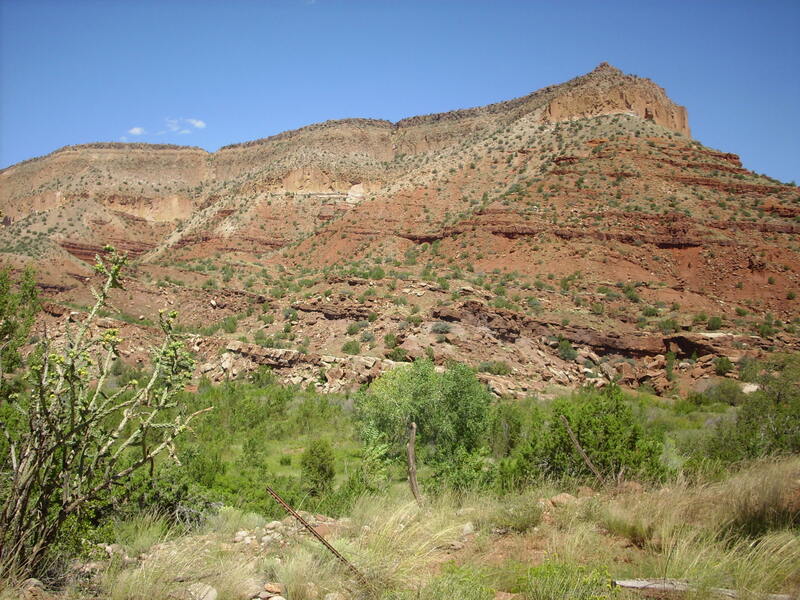 The Arroyo Peñasco Group survived only in areas where it had filled shallow valleys or where the African collision dropped blocks of crust to a lower level. The remaining exposed beds of the Arroyo Peñasco Group developed a karst topography. Modern karst topography often is mantled in a deep red iron-rich soil called terra rossa, which fills in the sinkholes and crevices in the underlying beds. This is particularly the case in tropical areas, and the Jemez area was located almost on the equator at this time. The Log Springs Formation is likely a preserved terra rossa formed on the karst topography of the Arroyo Peñasco Group, augmented with sediments eroded off the nearby highlands. Similar thin beds of red sediments (usually assigned to the Molas Formation) are found at the Mississippian-Pennsylvanian boundary throughout the western United States. I haven't bothered with a map of the Log Springs Formation, because it is nearly identical with the map for the Arroyo Peñasco Group. The Log Springs Formation is thin and spotty at Guadalupe Box, but it is much thicker to the west, in the southern Sierra Nacimiento Mountains. This is a further indication that there was high ground in southern Sierra Nacimiento at the end of the Mississippian. The exposure of the formation at Guadalupe Box is rich in hematite, which forms a thick coating on limestone clasts derived from the underlying Arroyo Peñasco Group. 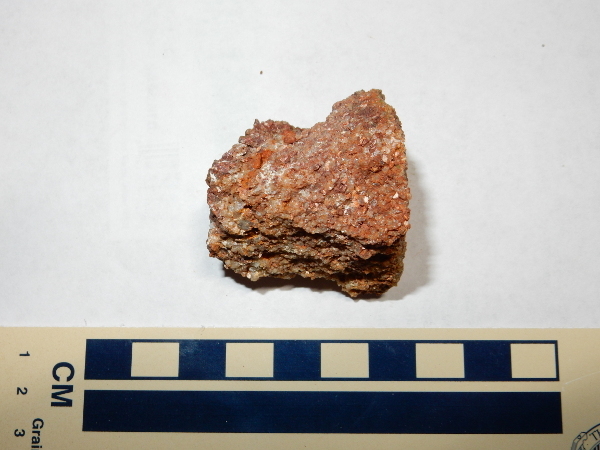 This sample shows the bright red color of hematite on the left, and somewhat darker color on the right where the nodule was partially buried. The sample has a high density, which I measured at around 4.3 g/cm3, whereas normal limestone has a maximum density of around 2.8 g/cm3. Solid hematite has a specific gravity of 5.26 g/cm3. 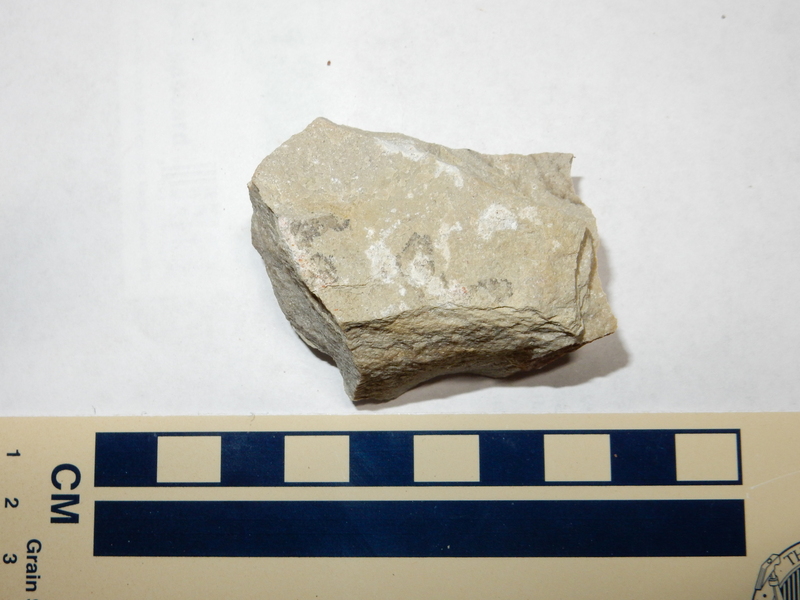 This suggests that there is considerable hematite coating on the limestone nodule. Hematite makes an excellent iron ore, but the beds here are neither rich enough nor extensive enough for economical exploitation. Hematite, Fe2O3, is a common minor component of sedimentary rocks. It is also common in weathered igneous and metamorphic rocks, but is rather uncommon in fresh igneous and metamorphic rocks. This is because of the chemistry of iron. An iron atom readily loses two electrons to form the ferrous ion, Fe2+, but with a bit of encouragement it can lose a third electron to form the ferric ion, Fe3+. Under conditions typical of the earth's interior, where metamorphic rock is formed and magma is generated, there is very little oxygen and iron tends to remain in the ferrous state. Thus, fresh igneous and metamorphic rocks contain most of their iron as ferrous minerals. Such ferric iron as is present is bound up with ferrous iron in magnetite. However, the high oxygen levels at the earth's surface ensure that ferrous iron is eventually oxidized to ferric iron, and most of this ferric iron exists as hematite or its hydrated counterpart, goethite, FeO(OH). Powdered hematite has a blood-red color, which gives it its name (Greek haima = "blood"). As the percentage of the hematite that has been hydrated to goethite increases, the color shifts to a yellowish brown. Massive hematite is dark red to black in color. Large deposits are mined as iron ore on every continent except Antarctica. However, well-crystallized hematite, which is jet black in color, is quite uncommon. Massive hematite can be identified both by its blood-red streak (produced by rubbing a sample against an unglazed porcelain plate) and by its high density. Unlike magnetite, hematite is not attracted by a magnet. 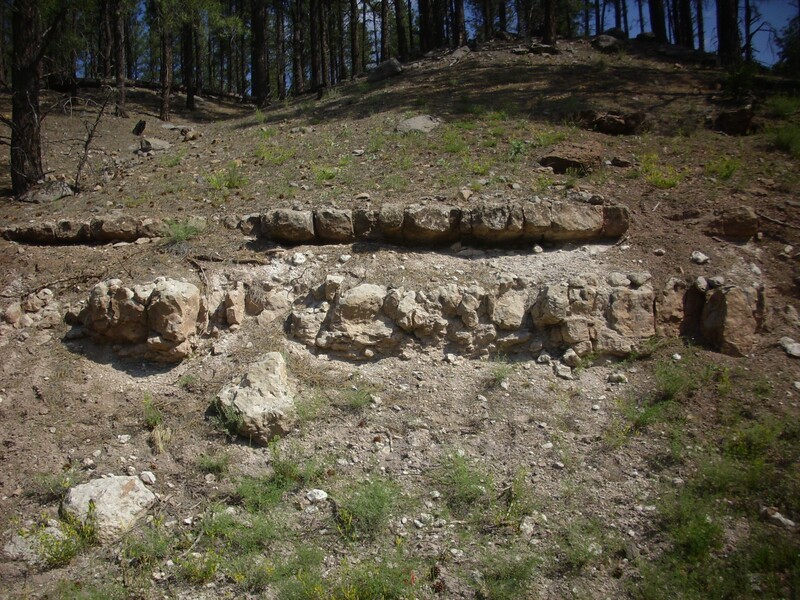 In a few locations, the iron-rich lower beds of the Log Springs Formation are overlain by a thicker sequence of mudstones, sandstones, and conglomerates, with the uppermost bends tending to have more coarse material. This suggests that increasing quantities of coarse sediments were being eroded off nearby highlands pushed up as part of the Ancestral Rockies. By 310 million years ago, New Mexico was again a shallow tropical sea studded with mountainous islands (the ancestral Rocky Mountains.) Limestone was deposited over much of the region. 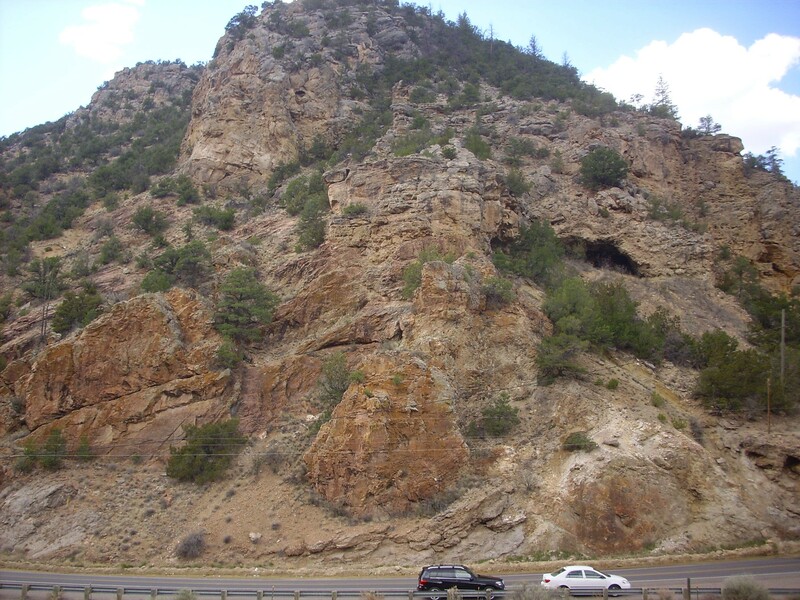 The lowest Pennsylvanian formation in the Jemez is the Osha Canyon Formation, first identified at Guadalupe Box. Here we see Osha Canyon Formation forming the south rim of an unnamed canyon, with overlying Sandia Formation forming the hill in the background. Notice the circular structure at lower right in the sample. This some kind of shelled fossil, though it is not possible to know what kind of organism it was from this single cross section. The Osha Canyon Formation is not nearly as widespread as the other Carboniferous formations of the Jemez, being found only in a limited area of the southwestern Jemez and southern Sierra Nacimiento. Perhaps this was a particularly low area into which the sea returned first. 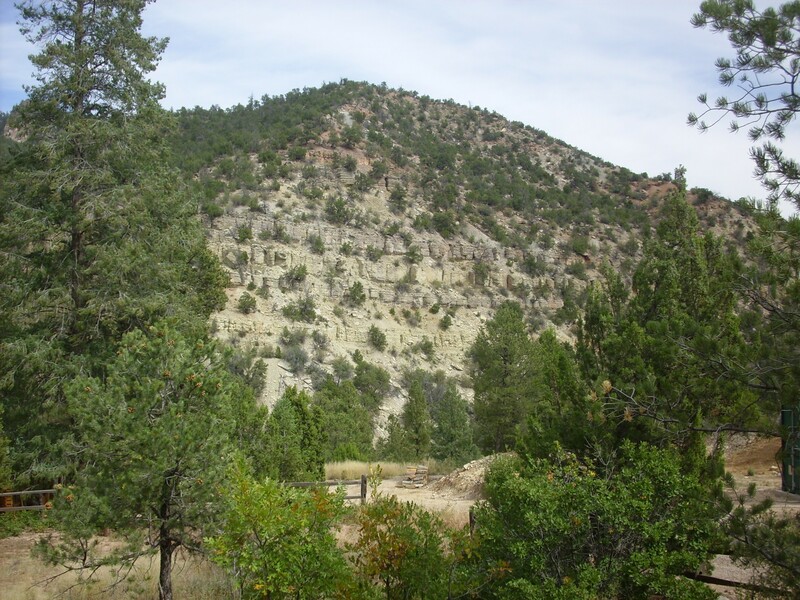 However, the Osha Canyon Formation is noted for the presence of fossil tabulate corals and for rare examples of a primitive giant echinoderm, Giganticlavus. Corals first appeared just before the start of the Cambrian, when their lineage diverged from animals having a bilateral body plan such as our own. Corals and their relatives (the cnidarians) show radial symmetry in their body plans instead. Tabulate corals are found in fossil beds from the latest Cambrian to the end of the Permian and are distinguished from modern corals by the presence of horizontal partitions (tabulae) in the reefs they form. The tabulate corals are among the families that were extinguished by the Permian-Triassic extinction event, of which we'll say more in the next chapter. Echinoderms share the bilateral body plan of vertebrates, though this gives way to a five-sided symmetry in many adult echinoderms (starfish being a particularly familiar example). Other modern echinoderms include sea urchins, sea cucumbers, crinoids (sea lilies), and sand dollars. Giganticlavus was a member of the edrioasteroid family, which, like the tabulate corals, became extinct at the end of the Permian. Close relatives of the crinoids, the edrioasteroids were cushion-like animals that attached themselves permanently to a surface. The Osha Canyon Formation is overlain by the sandstone and thin limestone beds of the Sandia Formation, which formed from sediment eroded off the rising San Luis Uplift. This is the first really widespread formation of the Phanerozoic Eon in northern New Mexico, with outcrops in the southwest Jemez, atop Sandia Crest, and in the Sangre de Cristo Mountains. It was first named by C.L. Herrick in 1900. Where it rests on Precambrian rock, the contact is easily identified. 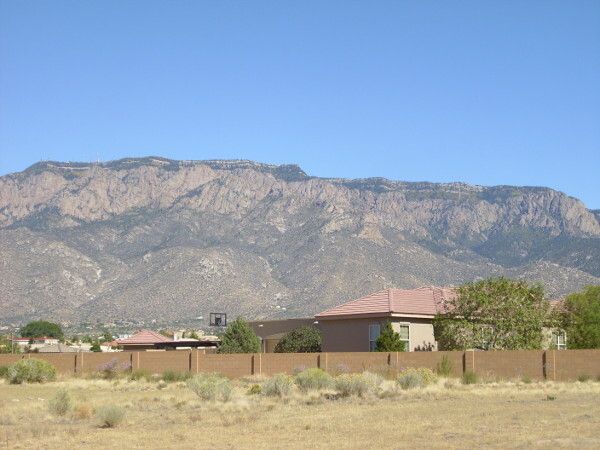 Where the Sandia Formation rests on Osha Canyon Formation or Arroyo Peñasco Group, it is distinguished by the transition from massive limestone to coarse sandstone, mudstone, and conglomerate, with only a few thin beds of limestone. These rocks are usually less resistant to erosion than massive limestone, so the Sandia Formation tends to be found underlying a slope between more vertical cliffs of Precambrian rock or Mississippian limestone below and later Pennsylvanian limestone above. Such a formation is sometimes described as a slope-forming formation. We saw beds of the Sandia Formation atop Sandia Crest in the last chapter, and we've already seen several photographs in this chapter showing Sandia Formation atop Osha Canyon Formation. 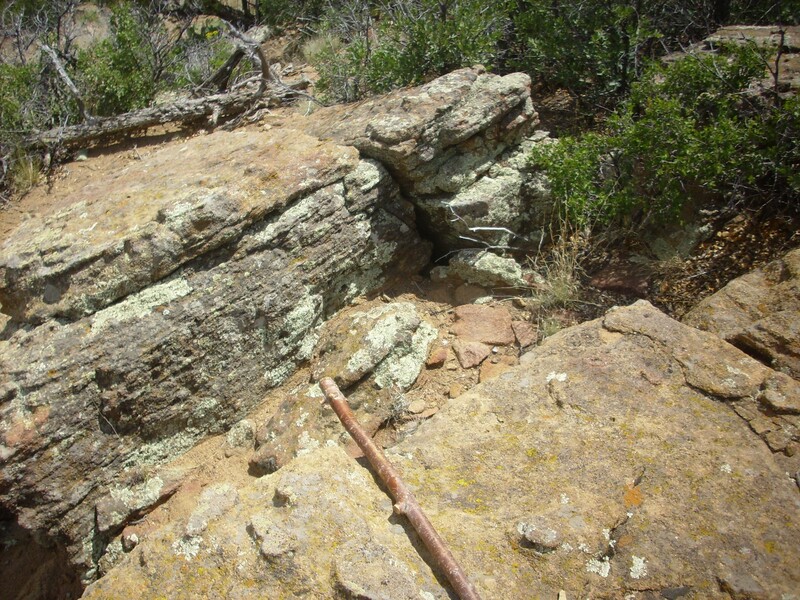 Here is a closer look at some of the prominent sandstone beds found near the base of the Sandia Formation. The multicolored patches on the rock are lichens, which are communities of fungi and algae. Lichens were among the first and most resilient forms of life to emerge from the oceans. There is an excellent chance that their lineage is older than the rocks they are encrusting here, and may reach clear back to the Paleoproterozoic. The base of the Sandia Formation at Guadelupe Box is a very coarse sandstone, of which a sample is shown above. The individual grains are obvious even to the naked eye. Under the loupe, these appear to be angular bits of yellowish quartz, all roughly the same size, with occasional fragments of feldspar or of clay formed by prolonged weathering of feldspar. There is some hematite between the grains, giving the rock its reddish to tan color, but the grains are not cemented primarily with hematite. The acid test shows no calcite present, and the rock is quite tough, so the grains are most likely cemented with silica. There is considerable pore space; this rock would make an excellent aquifer or reservoir rock for petroleum. The description I've just given of this sandstone hits on most of the classification criteria used by geologists to describe clastic sedimentary rock, that is, sedimentary rock composed primarily of broken fragments (clasts) of source rock rather than precipitated minerals. The first criterion is clast size. Sedimentary rock whose clasts are mostly in the range of 2mm to 0.0625mm is classified as sandstone. Rock with larger clasts (up to boulder size) is known as conglomerate or breccia, depending on whether the clasts are rounded (conglomerate) or angular (breccia.) Sedimentary rocks with smaller clasts are known as siltstones, mudstones, or shales. We'll see examples of most of these other kinds of sedimentary rocks later in the book. 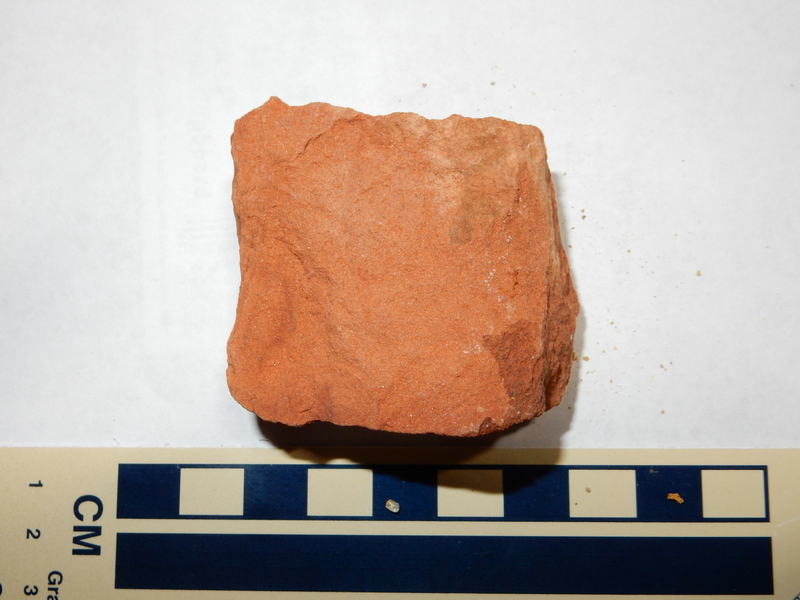 This sample is a sandstone, because its grains are all between 0.5 mm and 2mm in size. Another classification criterion is the mineral content. Most sandstones are composed largely of quartz, because quartz is the hardest and most stable common mineral under conditions at the Earth's surface. Feldspar is less chemically stable than quartz, slowly decomposing under atmospheric conditions into clay minerals, and it tends to shatter easily along its cleavage planes. Nevertheless, it is the second most common mineral in sandstone. A sandstone containing substantial feldspar (more than 25%) is called an arkose sandstone. Our sample here contains less than 25% feldspar and so is not an arkose. Fine-grained material between the larger clasts of a sedimentary rock, usually deposited at the same time as the larger clasts, is called matrix, while minerals deposited later from solution in groundwater are known as cement. 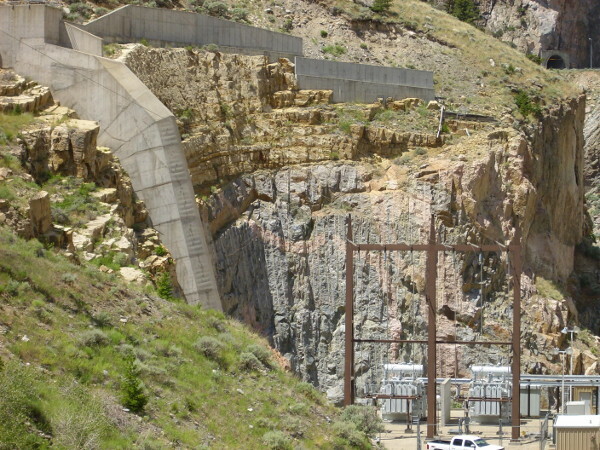 It is the presence of strong cement that produces the hardest (most indurated) sedimentary rocks. Sandstones with considerable pore space are known as arenites. They are distinguished from wackes that contain 15% or more clay minerals between the grains. 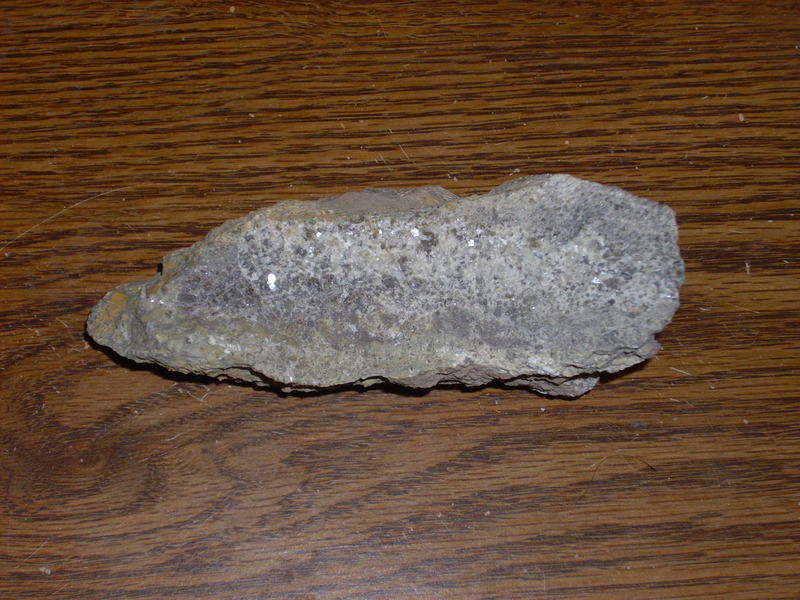 Because our sample has open pores with almost no visible clay matrix, it is a quartz arenite. Quartz arenites are considered mature sandstones, meaning they are formed from sediment that has undergone considerable weathering that has removed almost everything but the quartz. Our Sandia Formation sandstone is a bit unusual in that its grains are large, angular, and do include some bits of feldspar. It is thus not a supermature sandstone composed of almost pure quartz grains of nearly identical size (well-sorted) that are well rounded. Our sample is not particularly well-sorted for a sandstone. It is otherwise typical of sandstones that form deep in the interior of stable continents, where well-weathered sediments can accumulate slowly over long periods of time. 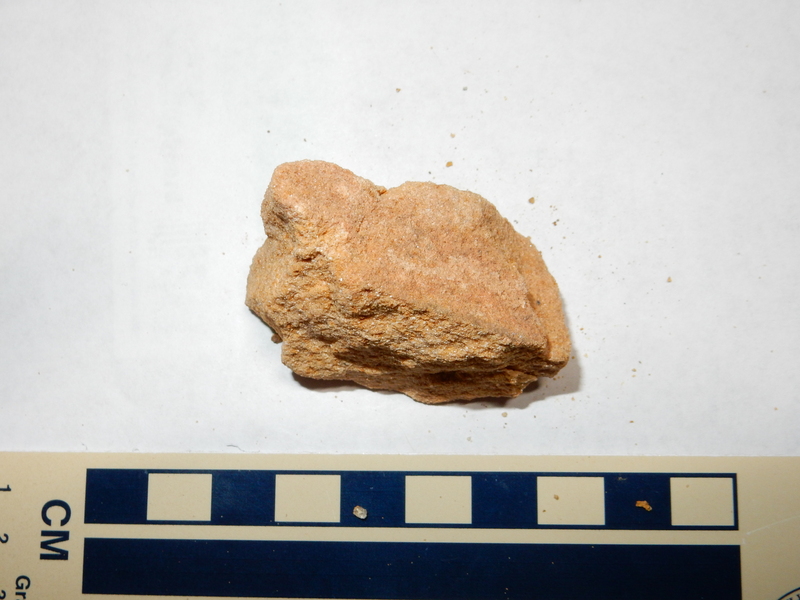 Most likely this sandstone was deposited in a beach environment during a marine transgression, with the large size and angular character of the grains suggesting they weathered from a nearby granitic highland -- the San Luis Uplift. 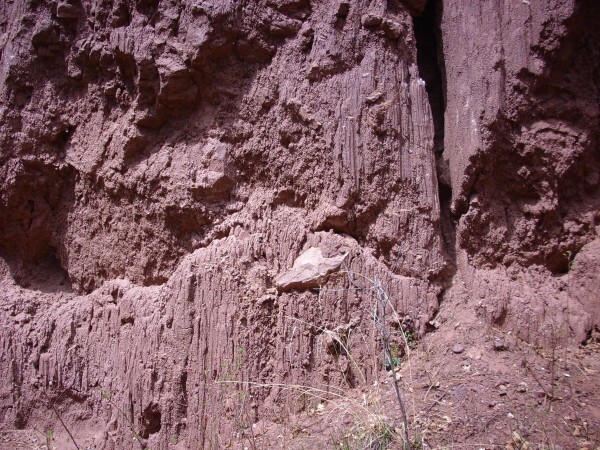 As one goes higher in the Sandia Formation, the sandstone tends to give way to softer siltstone and shale and then the limestone of the Madera Formation. This is a typical fining sequence of a marine transgression. The sandstone is laid down in a near-shore environment, then, as the epicontinental sea advances, siltstone and mudstone is laid down in water further from shore. The transgression sequence ends with deposition of limestone. Here is a paleotopographic map of the Jemez in the early Pennsylvanian, when the Sandia Formation was laid down. 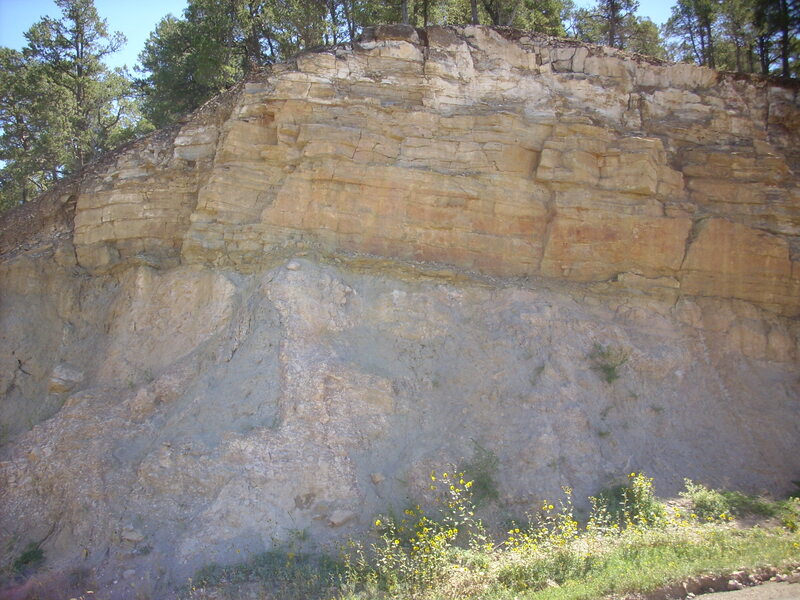 This shows that a large region north and west of the exposures of Sandia Formation has Madera Formation, the next youngest formation, resting directly on Precambrian rocks. This must still have been high ground during the early Pennsylvanian, but became submerged in the middle Pennsylvanian, when the Madera Formation was laid down. Above the Sandia Formation is the Madera Formation, the principle Pennsylvanian formation in the Jemez Mountains (and much of the rest of New Mexico.) It was deposited during a time when much of New Mexico was covered with a shallow sea, though sediments continued to be eroded off the San Luis Uplift and other ranges of the Ancestral Rocky Mountains. 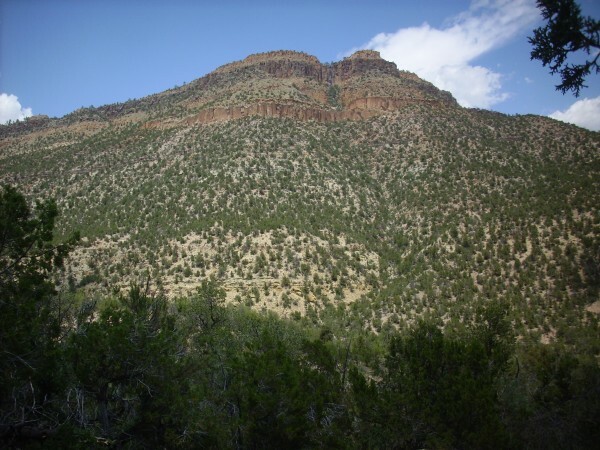 The Madera Formation is exposed in the valleys of the Rio Guadalupe and Rio de las Vacas and in Cañon de San Diego in the southwest Jemez, north of Soda Springs, as well as the Gallina area and underlying the Crest of Montezuma. There has been an unusual amount of controversy over the nomenclature for the Pennsylvanian limestones of the Jemez area. The Madera Limestone was first named in 1903, by C.R. Keyes. In 1946, the first geologists to properly map the Jemez area assigned its Carboniferous limestone beds to the Madera Formation, noting that the lower beds are a gray limestone and the upper beds are arkosic limestone. Arkosic limestone contains substantial amounts of feldspar. 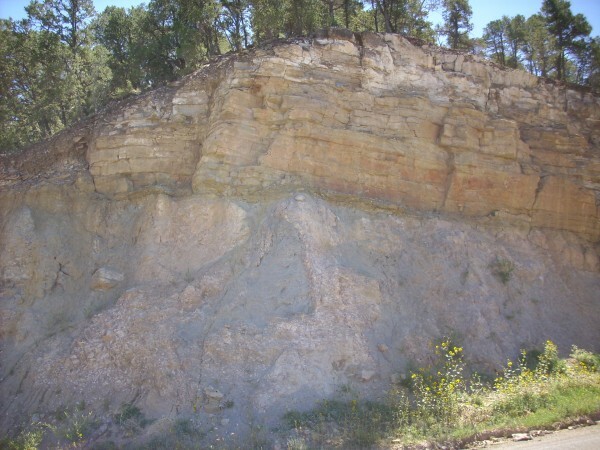 More recently, geologists have suggested promoting the Madera Formation to group status and designating the lower and upper beds as Grey Mesa Formation and Atrasado Formation. Other geologists had proposed abandoning the name Madera completely and assigning the upper beds to the Guadelupe Box Formation. This name appears on some more recent maps of the area. The Guadelupe Box Formation is further divided into the San Diego Canyon Member and the Jemez Springs Shale Member. Because the name Madera Formation or Madera Group remains the most common in maps and papers, I'll stay with that here. There is a very thick section of Madera Formation atop the Sandia Formation in Guadelupe Canyon north of Guadelupe Box. The boundary between the two formations is placed at the first substantial marine limestone bed. We've seen some photographs already, but here is a better look. Sandia Formation forms the tan beds at the base of Holiday Mesa, and the mesa is capped with Bandelier Tuff. Almost everything between is Madera Formation, which is hundreds of feet thick here. This area is reputed to be a paleontologist's playground, with some areas covered with gravel composed mostly of fossilized mollusks and brachiopods that have weathered out of the rock. However, the Rio Guadelupe is difficult to cross, and the climb up to the fossil beds is strenuous. Madera Formation continues to line the canyon walls for miles to the north, with a particularly fine exposure in the north side of Bale Canyon. Another exposure in northern Cebolla Canyon shows the upper part of the formation. Such exposures continue into the northern Sierra Nacimiento and the adjacent areas of the Jemez. This exposure is prominent in a road cut along State Road 126. Madera limestone forms cliffs along several miles of Cañon de San Diego north of Soda Dam. The highway climbs to the level of this particular set of beds a few miles up the road from Soda Dam, where there is a beautiful accessible exposure. The limestone here is coarsely crystalline with occasional crinoid fossils. Not all of the Madera Formation is this coarsely crystallized. It is probably this unusually coarse crystallization that makes these particular beds so resistant to erosion and thus so prominent in the canyon wall. There are also some large boulders of very coarse sandstone in this area, showing that the Madera Formation is not purely limestone, but contains some sandstone and shale as well. 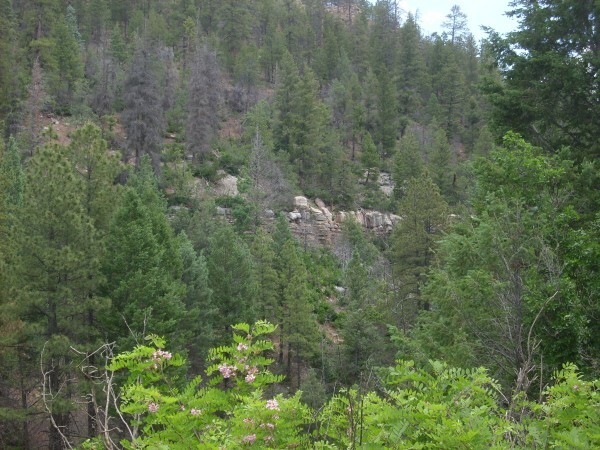 Nevertheless, in the Jemez, the Madera is mostly limestone. The uppermost Madera Formation beds are exposed along the hiking trail at the foot of Battleship Rock. 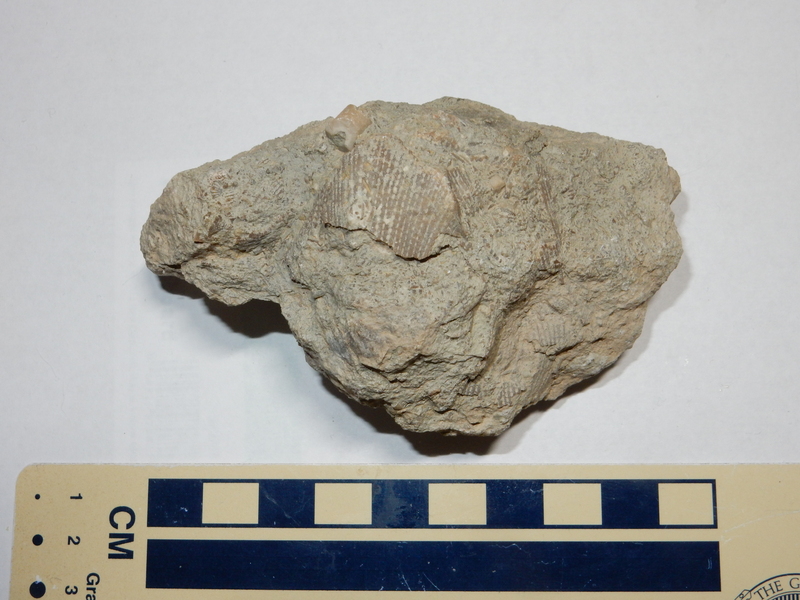 The Madera Formation limestone is rich in fossil brachiopods, mollusks, and crinoids, and I have collected some fossils from a number of sites west of State Road Four in this general area. 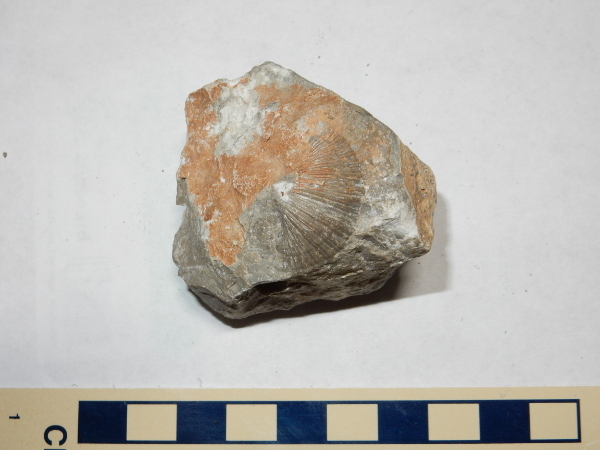 Fossil brachiopod in Madera Group limestone. Possibly Spirifer? Fossils in Madera Group limestone. Note the bryozoan fossil at center and the crinoid fossil near the top. Click to enlarge. Fossils weathered from Madera Group limestone. Crinoid stem fragments at top; brachiopod at bottom. It should be clear from these photographs just how extensive the Madera Formation is in the western Jemez area. 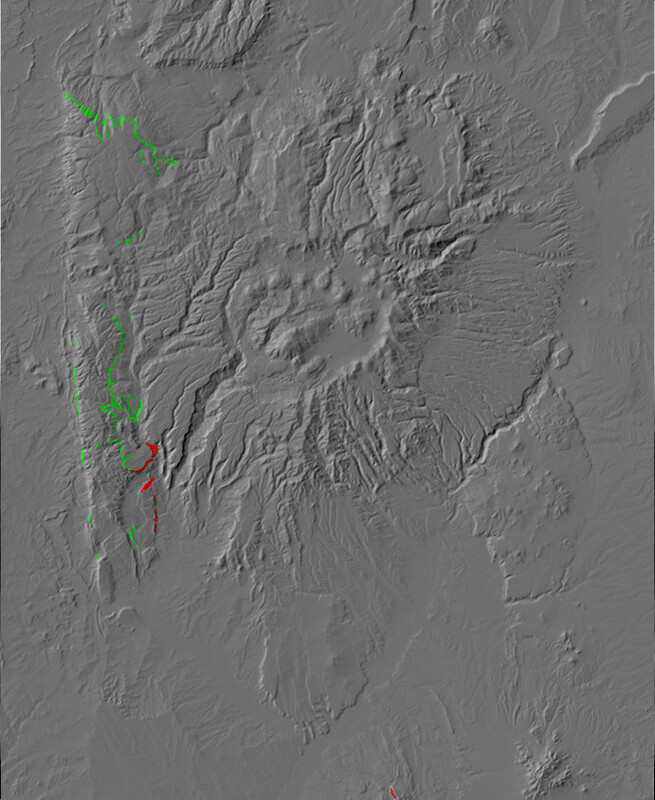 It dominates the Carboniferous exposures mapped in red in the relief map at the start of this section. The Mississippian marked the emergence of the first reptiles, which were able to lay eggs on dry land. The armored fish of earlier periods were largely displaced by sharks and bony fish, and, during the Pennsylvanian, arthropods (animals such as insects and spiders, having exoskeletons and jointed legs) swarmed across the landscape. 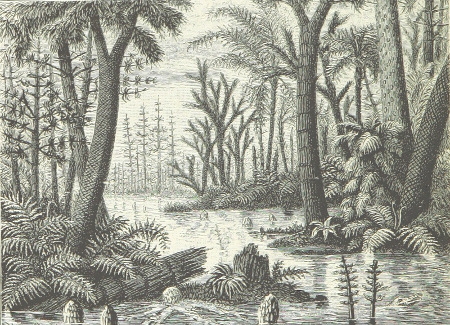 Vegetation of the Carboniferous included tree ferns and other large non-seed-bearing plants, but early seed-bearing plants such as cycads were also present. However, because New Mexico was under a shallow sea, these forms are not present as fossils in the Jemez. Instead, we find shallow marine fossils, dominated by bryozoans, brachiopods, mollusks, and crinoids. Bryozoans are distant relatives of both mollusks and annelid worms, first appearing in the fossil record in the early Ordovician (about 480 million years ago.) They are microscopic animals (up to 0.5mm in size) that form large colonies of various forms. Those found as fossils in the Jemez created calcified "fronds" like that in one of photographs above. These were covered with bryozoans living in their own individual pockets, somewhat like a coral. However, bryozoans are not close relatives of coral. There is some functional specialization among the individual bryozoans in a colony, so that they are not truly independent animals, in the way that individual polyps in a coral reef are. Mollusk fossils in the Jemez are mostly bivalves, that is, mollusks with two symmetrical shells, resembling modern clams or scallops. 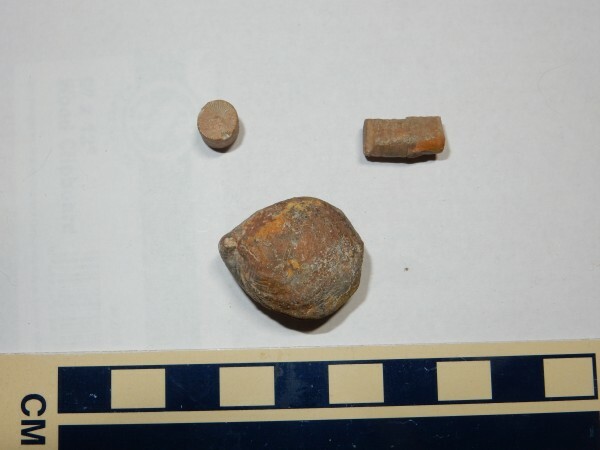 I once accompanied a den of Webelos Scouts (Boy Scouts in larval form) on a fossil hunt in which one of the boys found a marine snail fossil, but they are not common in the Jemez. The first unambiguous molluscs appear in the fossil record in the Cambrian, 500 million years ago, but mollusc-like animals may go back to the Precambrian. More common are brachiopods, distant relatives of mollusks, which at first glance look like a variety of clam. However, brachiopods have asymmetrical shells, as you can see in the photograph above. This is most evident around the hinge, which lies to one side. The edges of the shell are also typically curved in a distinctive way. This asymmetry reflects a significant difference from bivalve mollusks: Bivalve mollusks have shells on either side of their soft bodies, while brachiopods have shells on the top and bottom of their soft bodies. There are significant differences in their internal anatomy as well. Brachopods have an "arm" or lophophore of fine, cilia-covered tentacles within their shells that is unlike anything among the molluscs. Brachiopods first appeared at about the same time as the molluscs, but are actually more closely related to bryozoans. Fossil brachiopods are found in the Arroyo Peñasco Formation, but are almost embarrassingly abundant in the Madera Group. In the modern world, mollusks remain abundant in many environments, but brachiopods are restricted to deeper, colder ocean waters. Crinoids are relatives of starfish, sea urchins, and sea cucumbers. These first appear in the fossil record in the Ordovician. The crinoids of the Carboniferous were mostly relatives of the modern sea lily, which attaches to the ocean floor by a long stalk and has a cluster of tentacles surrounding its mouth. Fossil fragments of crinoids are typically from the stalk and take the form of distinctive segmented cylinders. However, the tentacles or "fronds" were sometimes preserved as fossils, though I have never had the fortune to find well-preserved fronds. If you are thinking of hunting for fossils in the Jemez, be aware that the regulations governing fossil collection on public lands are a bit murky since the passage of the Paleontological Resources Protection Act of 2009. You are perfectly fine collecting fossils on private land with permission of the landowner. At the other extreme, if you collect any kind of fossil on National Park or National Monument land, then Heaven have mercy on your soul. If you encounter a vertebrate fossil on any public land, my best advice is to treat it like a rattlesnake: Do not disturb it; back away slowly. The uncertainty is over how the Act affects amateur fossil hunters engaged in casual collection of common invertebrate fossils. My best read of the current state of regulations is that it is legal for rock hounds to collect a reasonable number of invertebrate fossils for personal study on National Forest or BLM land. However, it's always a good idea to be mindful of those who will come after you, and interpret "reasonable" conservatively, restricting yourself to a few choice specimens that you don't have to excavate for. If your fossil collecting involves large boxes or the use of a shovel, you're probably over the line. The paleotopography map for the Madera Formation is shown below. This map shows that there was still high terrain in the Sierra Nacimiento in the late Pennsylvanian, with a sizable ancestral range to the north and a much smaller ancestral range to the south. These are fairly unambiguous; the Madera Formation is thick and distinctive everywhere else, but in these areas the next younger formations, the Abo and Cutler Formations, rest directly on Precambrian rocks. Geologists G.H. Wood, Jr., and S.A. Northrop, who surveyed the area for the U.S. Geological Survey in 1946, first recognized that the Sierra Nacimiento was high ground during the Pennsylvanian based on their observations of the Permian beds. This ancient uplift is known as the Penasco uplift, and indications are that the ground here began rising in the early Pennsylvanian, during the deposition of the Sandia Formation. The Penasco Uplift was remarkably similar to the modern Sierra Nacimiento. The uplift seems to have been tilted to the east, and the western boundary was a fault less than a kilometer (0.7 miles) east of the fault that marks the western edge of the modern range. By the middle Pennsylvanian, sea levels were rising again relative to the Ancestral Rockies. The evidence for this is that the Madera Formation has indications of onlap, where younger beds extend further onto the underlying Precambrian basement than older beds. The higher terrain must have had low relief, because there is little indication that much coarse material was shed into the surrounding basins, as would be expected if there were any rugged mountains present. Guadelupe Box has the most complete column of Carboniferous rocks on the west side of the Rio Grande Rift in the Jemez area. There is another good exposure, though slightly less complete, on the east side of the Rift at the Crest of Montezuma. The Crest of Montezuma is a horst on the east side of the Las Huertas graben. The hill I'm standing on to take this photograph is the west horst of the graben. 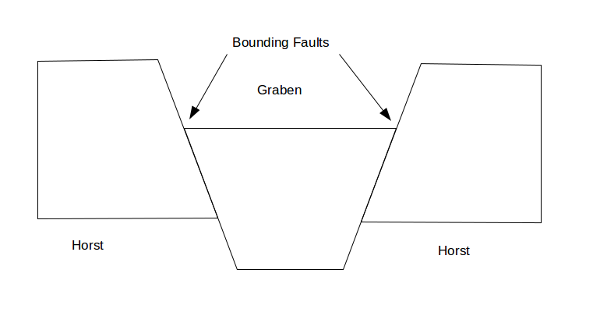 The walls of the graben, called the horsts, are fault escarpments of the bounding faults. The terms graben and horst are German and were first used to describe the geologic structure of the Rhine Valley. The East La Huertas Fault runs along the base of the Crest of Montezuma, where is separates Permian Abo Formation beds from older Precambrian or Carboniferous beds. The entire valley floor here, where it is not covered with alluvium, exposes red beds of the Abo Formation. The lowest part of the Crest towards its north end (to the left in the photograph) is Precambrian quartzite. Above this are Arroyo Peñasco Group limestone beds, There may be a thin bed of Log Springs Formation above this, but too thin to map. Then comes a slope of Sandia Formation sandstones and mudstones above the limestone beds of the Arroyo Peñasco Group and below the first massive limestone bed of the Madera Group. The section here is missing the Osha Canyon Formation and most of the Log Springs Formation. When the U.S. Army occupied New Mexico in 1846, Navajo raids on Pueblo and Mexican settlements had been a regular occurrence for centuries. U.S. forces were inadequate to protect every vulnerable point, so in the summer of 1849, Lieutenant Colonel John M. Washington, the military governor of New Mexico, prepared to lead a punitive expedition into the Navajo country of northwestern New Mexico. Accompanying the expedition was Lieutenant James H. Simpson, an officer with the Corps of Topographic Engineers. Simpson had helped map the route from Fort Smith, Arkansas, to Santa Fe, which would much later become Interstate 40. A seasoned and perceptive explorer, who was in the field almost nonstop from 1849 until the Civil War, Simpson would give the first detailed account of country that had been previously ignored by Mexican and American authorities. He had with him the artist R.H. Kern, who would provide illustrations of landforms for Simpson's account. The expedition descended through La Cienega and the canyon of the Santa Fe River before crossing the northern part of the San Felipe volcanic field. The expedition spent three days at Jemez Pueblo, where Simpson made the first detailed geologic observations of Ca ñon de San Diego. He took particular note of the old Spanish Queen copper mine, which was delved into beds of "red argillaceous rocks." The red beds extending throughout the canyon marked a major change in the tectonics of the Jemez region, where the shallow marine environment gave way to continental deposition in a river environment. 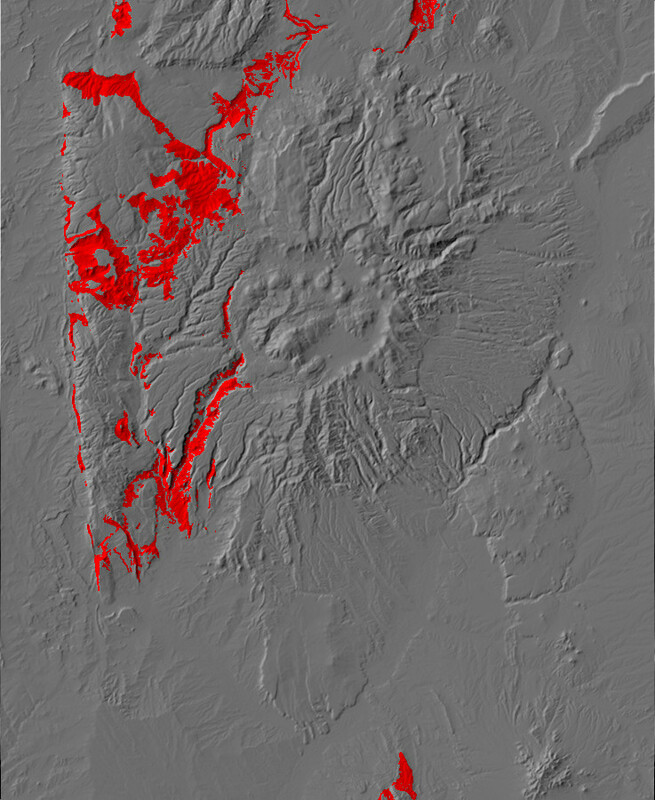 Relief map of the Jemez with Permian outcroppings highlighted in red. Geologists put the end of the Pennsylvanian and the beginning of the Permian period at about 299 million years ago. By then, most of the continental crust of the Earth had finished assembling into the supercontinent of Pangaea, and amniotes, animals laying eggs that could hatch on land (early reptiles, dinosaurs, and mammals), began to proliferate. The Permian began with an ice age, possibly triggered by the exposure of great masses of rock in the mountain ranges thrown up where the continents collided and joined together. The exposed silicate rock would have absorbed carbon dioxide from the atmosphere as it weathered, reducing the atmospheric greenhouse effect. The same effect has occurred in geologically recent times, when the rise of the Himalayas produced the ice ages that the first humans were forced to adapt to. Most of what are now the southern continents (Gondwanaland) was located very close to the south pole. It is in the regions that were once part of Gondwanaland that we find the geologic evidence for massive glaciation at this time. The Permian was also marked by lower sea levels and a drier climate than the Carboniferous, and the vast coal swamps dried out and were replaced by large deserts in the interior of Pangaea. It was during this time that the last of the trilobites, which had become abundant during the Cambrian, died out. Seed plants, such as seed "ferns", primitive conifers, and ginkgoes, became widespread, in part due to the increasingly dry climate. A single species of ginkgo, Ginkgo biloba, survives today. A large area of west Texas and southeast New Mexico was a shallow sea, the Permian Basin, which was periodically flooded with seawater from a narrow channel to the south. Great thicknesses of sediments and salt and gypsum beds were deposited there. This is now oil country, and the salt beds are being exploited for the long-term storage of nuclear waste. Central North America was relatively high and dry during this time, and ocean crust was subducting under what is now the Sierra Nevada along the California-Nevada border. The Jemez area was a relatively low-lying area very close to the equator, located between the high terrain to east and west, with river valleys meandering south to the Permian Basin. 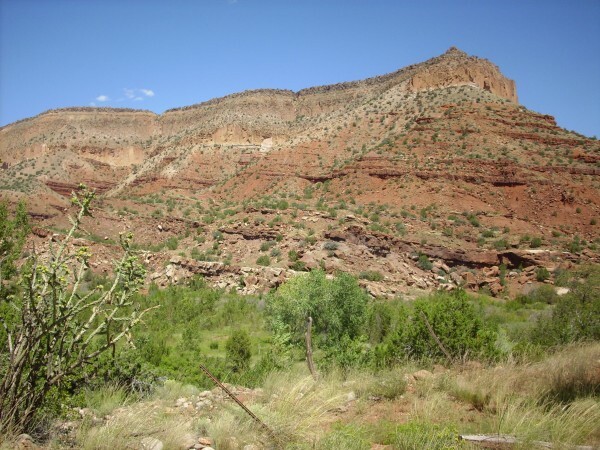 Extensive marine and continental sedimentary beds were laid down, and Permian beds are now exposed over more than 13% of the area of New Mexico. Much of the sediments that form the Permian formations were eroded off the San Luis Uplift, which was still prominent to the north, and the Pedernal Uplift, to the southeast. However, the Penasco Uplift, coincident with the modern Sierra Nacimiento, was finally buried under sediments during the Permian, though the Permian beds thin towards the crest of the Sierra Nacimiento in a way that suggests that the area was subsiding more slowly than its surroundings. The transition from Pennsylvanian to Permian time is visible in the area around Battleship Rock. Here, in the Cañon de San Diego, the Jemez River has cut through younger rock to expose the entire geological column in this area. Across from the Battleship Rock parking lot, the road cuts into the upper Madera Formation. There is no sharp transition from the Madera Formation to the lowest formation of the Permian in the Jemez, the Abo Formation. The sea was receding to the south, but the shore moved back and forth, depositing alternate layers of limestone characteristic of the upper Madera Formation (which are rich in fossils) and of sandstone and mudstone characteristic of the lower Abo Formation. The latter represents deposition of sediments eroded off the San Luis Uplift in a river delta close to the shore. The geologic map of this area maps this road cut as Madera Formation, putting the boundary with the Abo Formation at the highest limestone bed that is more than a meter thick. Well, you have to put the line somewhere. The vagueness of the boundary between the Pennsylvanian and the Permian in the Jemez is not unusual.This is perhaps the most subtle period boundary in the geologic record worldwide. These alternating beds of fluvial mudstone and sandstone and marine limestone may be cyclothems. 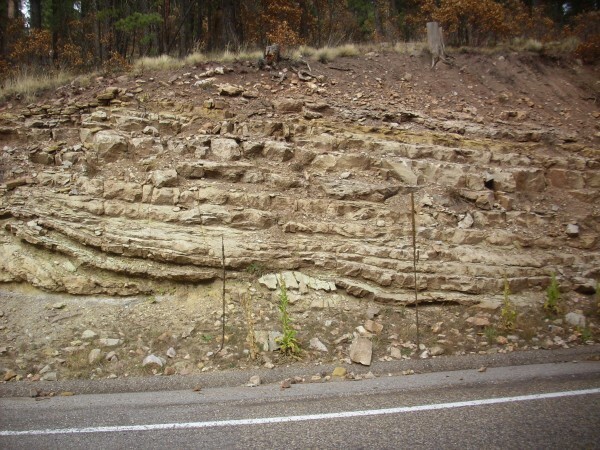 Cyclothems are alternating beds of marine and continental sedimentary beds, often including layers of coal, that are extremely well-developed in Appalachian rocks of late Pennsylvanian and early Permian age. They are interpreted as resulting from fluctuating sea levels, which in turn reflect the advance and retreat of glaciers of the southern hemisphere during the Karoo Ice Age. When the glaciers advanced, sea levels dropped and continental sediments were deposited; when the glaciers retreated, sea levels rose again, and marine sediments were deposited. There were at least sixty such episodes of glaciers advancing and retreating during the Karoo, and each produced a cyclothem in the Appalachian area. The cyclothems of the Madera-Abo transition of the Jemez, if that is what they are, are rather poorly developed examples, but they do show the basic feature of alternating marine and continental sedimentary beds. There are some limestone beds towards the south end of this road cut. There is also gray patches of mudstone above the limestone, more typical of the Abo Formation. As I said, it's gradational. These patches are beds that contained enough organic matter to reduce the bright red ferric iron to soluble ferrous iron, which was then leached away to leave gray clay minerals. Further down the road, as you approach Hummingbird Music Camp, it's all limestone and limy shale and definitely Madera Formation. The limy shale here weathers into clasts that I have read described, quite accurately, as ball bearing clasts. I once tried to walk across a limestone ledge covered by these rock fragments and discovered just how slippery they can be, slipping and going down hard. I should have taken my backpack off first. Consider yourself warned. 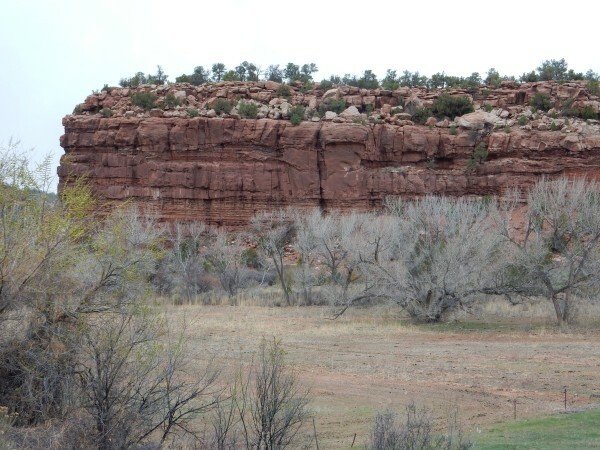 East of Battleship Rock, in the valley of the East Fork, Jemez River, the southern valley walls are dominated by Abo Formation. To be sure, the last shot is close enough to river level that it is ambiguous whether this is upper Madera Group mudstone or lower Abo Formation mudstone. Regardless. It's mudstone and it's in the neighborhood of 300 million years old. Relief map of the Jemez with Abo Formation and Cutler Group outcroppings highlighted in red. The Abo Formation marks the transition from the shallow marine environment of the Pennsylvanian to the river delta environment of the Permian. Limestone is replaced by numerous thin beds of alternating red sandstone and mudstone. The Abo Formation is widely exposed in lower Cañon de San Diego. In the next photograph, everything from the foreground hills to the lower slopes of the distant mesas is Abo Formation. The entire lower portion of southern Mesa de Guadalupe is mapped as Abo Formation. 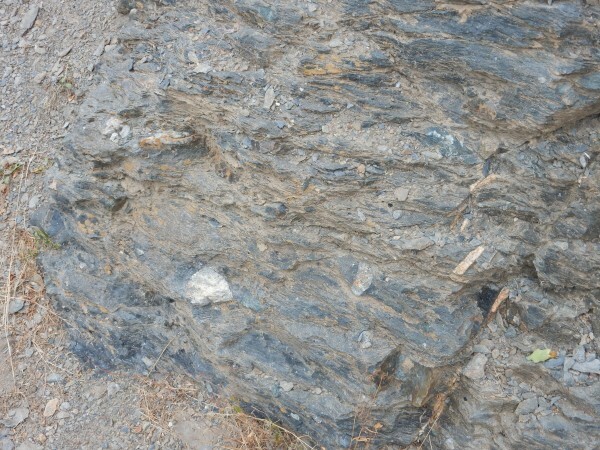 The thin sandstone layers interbedded with softer shale are characteristic of the fluvial (river delta) environment in which the Abo Formation was laid down. The lowest layers look limy from this vantage point, suggesting the gradation into the underlying Madera Group, but none of the latter is mapped here. The Abo is capped with Tshirege Member, Bandelier Tuff, a discontinuity of at least 279 million years, showing that erosion had already exposed the Abo here 1.25 million years ago when the Tshirege Member was erupted. Near here is the Spanish Queen mine, which was once mined for copper. The mine has also produced plant fossils and tetrapod bones. You may have been struck by the fact that the younger Abo Formation is present in lower Cañon de San Diego, but older Madera Formation is present in upper Cañon de San Diego at a higher elevation. The explanation is that the Jemez Fault crosses Cañon de San Diego near Soda Dam, and the area southeast of the fault has been thrown down hundreds of feet. This has dropped the Permian beds below the level of the Carboniferous beds to the northwest. The Abo Formation crops out throughout the western Jemez. It is found in the western caldera rim, suggesting how far the caldera floor dropped during the Toledo and Valles events. The more resistant beds are partly thin limestone and partly a durable coarse red sandstone. Under the loupe, this sandstone is found to consist of well-sorted small quartz clasts, but with a considerable amount of reddish hematite in the pore spaces. 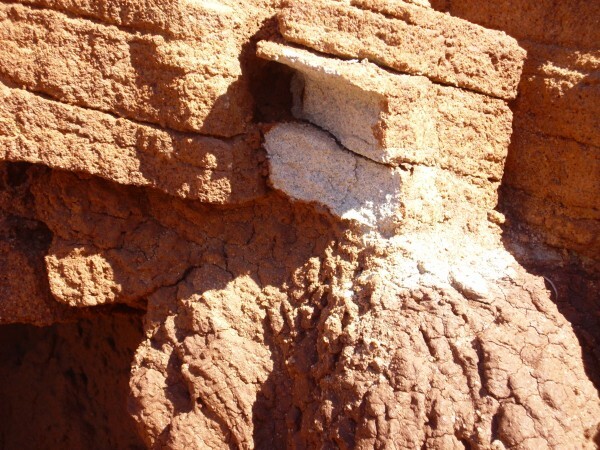 When acid is dripped on the rock, it foams vigorously, showing that calcite is an important component of the cement holding the grains together. This likely came from the nearby limestone beds, transported by ground water. The less resistant slopes in the photograph are a poorly cemented mudstone. 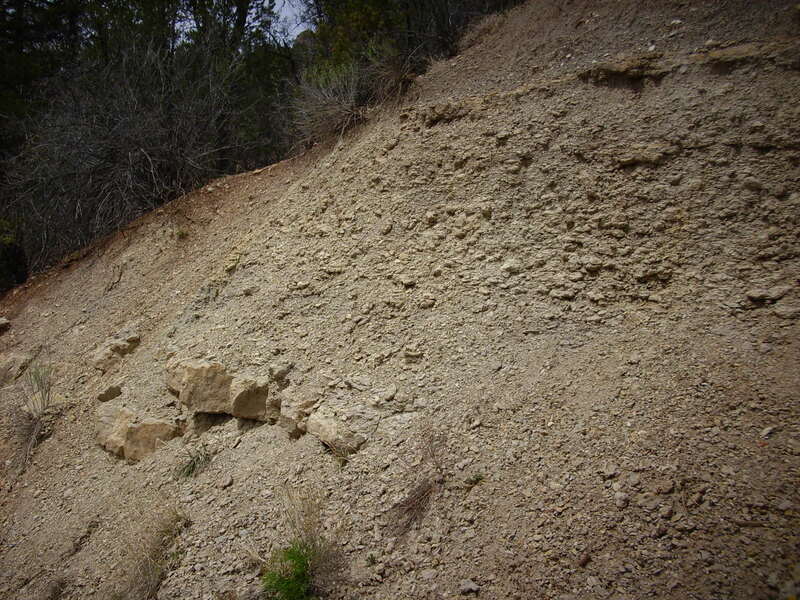 Particularly massive exposures of the Abo Formation are found along Forest Road 376 in Cebolla Canyon. A close look reveals that the sandstone here is unusually coarse, grading into conglomerate. The northernmost exposures of the Abo Formation, mapped as such, are in upper San Antonio Canyon. The last clear exposures are not far from San Antonio Springs. Further up canyon, the exposures are very poor, but discernible because of the characteristic red color. These are the northernmost outcrops, not for geologic reasons, but for definitional reasons. 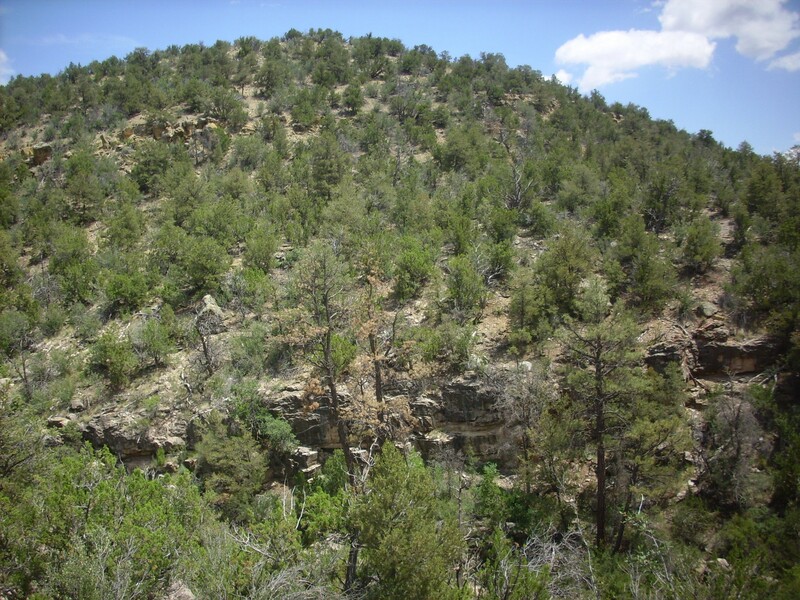 The Abo Formation was first identified in 1909 in Abo Canyon, in the southern Manzano Mountains. It took some time for geologists to map this extensive formation, which covers much of central New Mexico. Earlier, in 1906, a different team of geologists identified the Cutler Formation in the Silverton area. Again, it took some time for geologists to recognize that this formation extended far to the south and west, and to promote the formation to group status. Meanwhile, both names became deeply entrenched in the geologic literature. This became a bit of a problem when it was realized, by geologists G.H.Wood and S.A.Northrop in 1946, that the two formations meet seamlessly at about 36 degrees north latitude in the Jemez region. They are about the same age and they're both fluvial red bed formations. It would seem that the Abo Formation and the Cutler Group are really the same unit. Geologists resolved the problem by declaring that early Permian red beds north of 36 degrees north latitude will be mapped as Cutler Group, while the corresponding beds south of 36 degrees north latitude will be mapped as Abo Formation. And now you know why the Abo exposures in upper San Antonio Canyon are the northernmost exposures of the Abo: They are located just south of 36 degrees north latitude. Further afield, the Esplanade Sandstone of the Grand Canyon is identical in age with the Abo Formation and Cutler Group, as are the Halgaito Formation, Cedar Mesa Sandstone, and Organ Rock Shale, which extend from the Four Corners region to the San Rafael Swell. The dominant Permian formation of the northern Jemez is the Arroyo Del Agua Formation of the Cutler Group. This is beautifully displayed in a number of locations, of which the most accessible is in a road cut west of Abiquiu along the Canones Fault Zone. The Canones Fault Zone marks the boundary between the Rio Grande Rift and the Colorado Plateau, and it is a geologist's playground. We'll come back to this area repeatedly in the pages ahead. For the moment, we will focus on the Permian formations in this area. The lowermost red rocks, with the many layers and the column-like structures, belong to the Arroyo del Agua Formation. This is an early Permian formation, dating back about 280 million years or so, composed of alternating mudstone and sandstone. Sitting on top of the Arroyo del Agua Formation is the Shinarump Formation of the Triassic Chinle Group, which was laid down about 230 million years ago. Thus the contact between the two beds, where the beds are at the same angle and the contact is not necessarily obvious, is a good example of a discomformity. There is a gap of over 50 million years between the two beds. 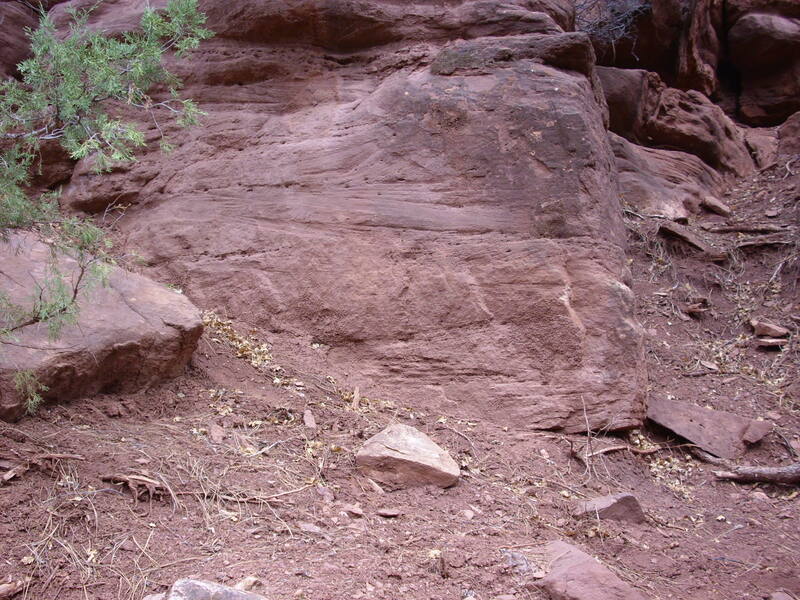 Most of the Arroyo del Agua Formation is soft mudstone, deep red in color due to its hematite content, but with occasional thin beds of sandstone. Here's a close up shot. 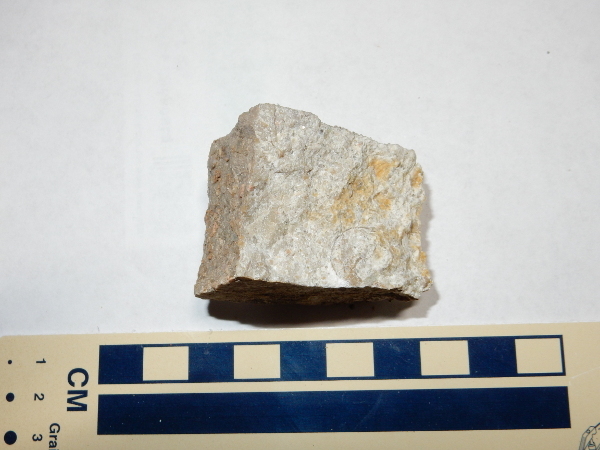 Notice the white color of the fresh fracture surface (where I hammered off a sample). The old surface is coated with a thin layer of red mud from higher up in the formation. However, some of the sandstone beds do contain red minerals. Here are close ups of some samples. 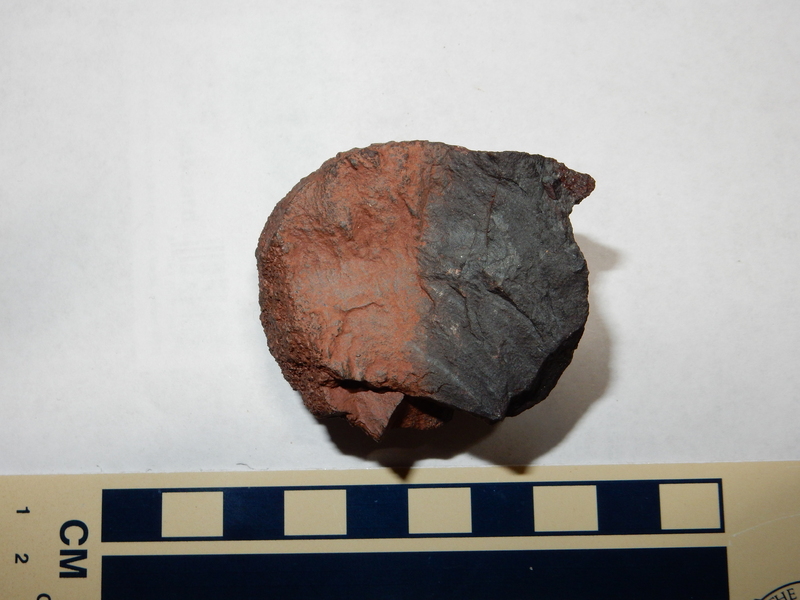 This is a sample of the relatively soft mudstone making up most of the formation. There is a fair amount of sand mixed in with silt and clay. The next sample is from the thin beds of sandstone between the layers of mudstone. This is harder stone that stands out of the softer mudstone. 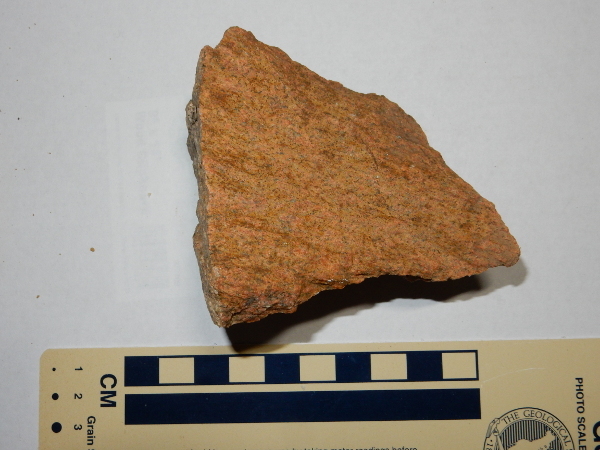 In this sample, the sandstone is relatively clean of oxidized iron. 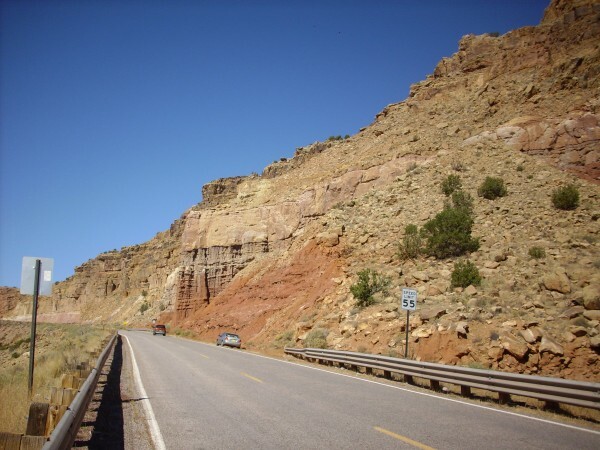 Generally speaking, the Cutler Group represents sediments eroded from the Uncompahgre Uplift and deposited by rivers approaching the Permian Basin south of what is now the Jemez area. The sandstone layers were probably deposited within the river channel itself, where the sand was washed clean of finer sediments. 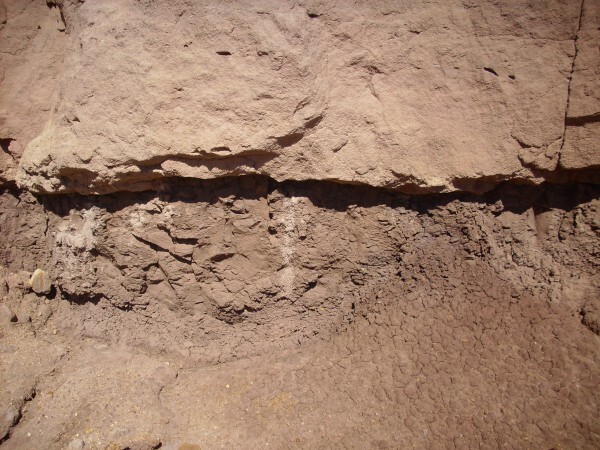 The preponderance of mudstone in the Arroyo del Agua Formation suggests that the climate had started to dry out at about this time. And here's a sample of the very hard mudstone just under the discomformity. Arroyo del Agua Formation mudstone from just below the contact with the Shinarump. Besides being strongly indurated, this stone has a peculiar, almost waxy, feel to it. Though not as convenient to the highway, the exposures of the Arroyo del Agua Formation on the south face of Mesa Montosa west of Coyote are spectacular. 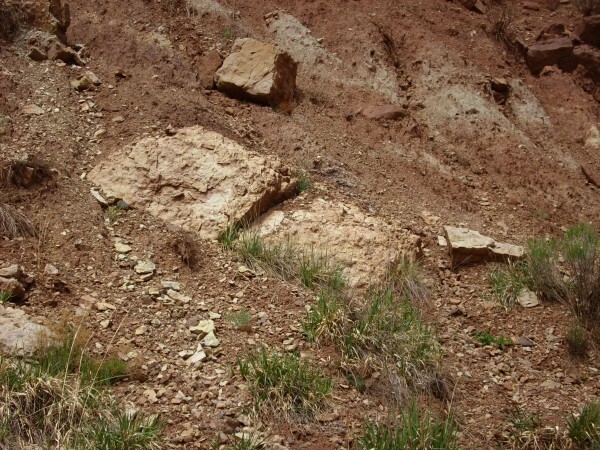 There are thin beds of Shinarump and Salitral Formation towards the top of the mesa, then the resistant cap of Poleo Formation; the last three formations are all part of the Triassic Chinle Group. The lower formation of the Cutler Group, the Canyon del Cobre Member, is exposed in Arroyo del Cobre and Canyon del Cobre. This shows the westernmost wall of Arroyo del Cobre. Canyon del Cobre is located beyond the ridge towards the right. 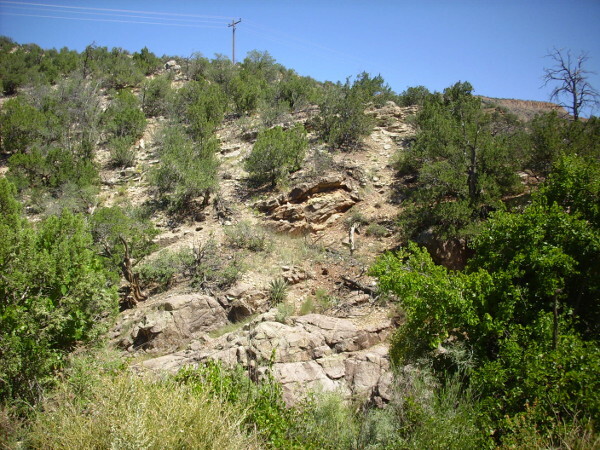 The Canyon del Cobre Member is exposed in the lower canyon walls. It straddles the Pennsylvanian-Permian boundary, and its lowermost beds in Canyon del Cobre include some of the best known assemblages of fossilized Pennsylvanian tetrapods (amphibians and reptiles). 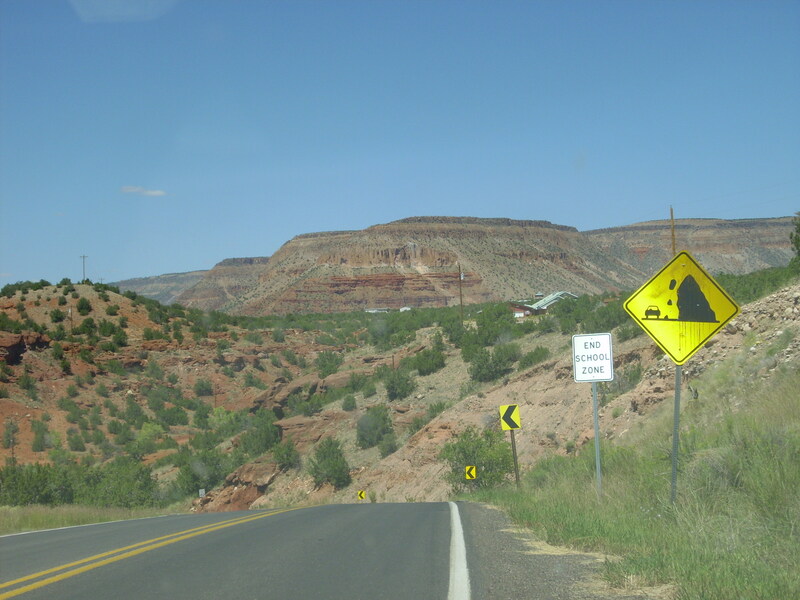 The Canyon del Cobre Member is exposed closer to the highway west of Coyote. This area is notable both for fossil quarries and for uranium prospects. We've now seen several formations that consist at least in part of mudstone. Mudstone is clastic sedimentary rock whose clasts are less than 0.0625 mm in size. if the clasts are mostly between 0.0625 mm and 2 microns in size, the more precise term is siltstone. If the clasts are mostly clay particles less than 2 microns in size, the more precise term is claystone. 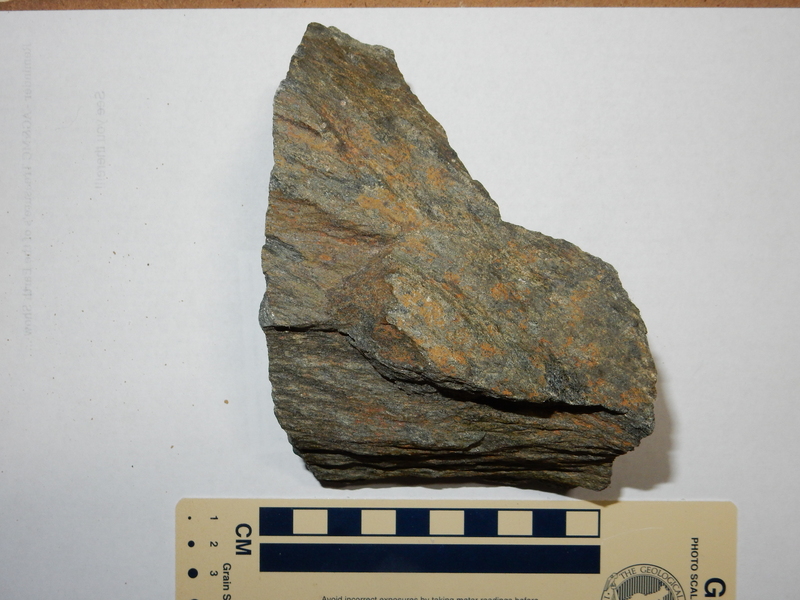 If the rock easily splits into thin layers (is fissile), it is described as a shale. Induration is the geological process of consolidated sediments being converted to solid rock. The individual clasts are cemented together, usually by additional minerals brought in by groundwater. The degree of induration depends primarily on how much and what kind of cement binds the clasts together. The most common cements are clay minerals, calcite, hematite, amorphous silica, and quartz, in order of increasing hardness. A sandstone cemented with abundant quartz is a very hard rock, while a sandstone cemented with sparse clay minerals will be so soft that it crumbles to the touch (it is friable). 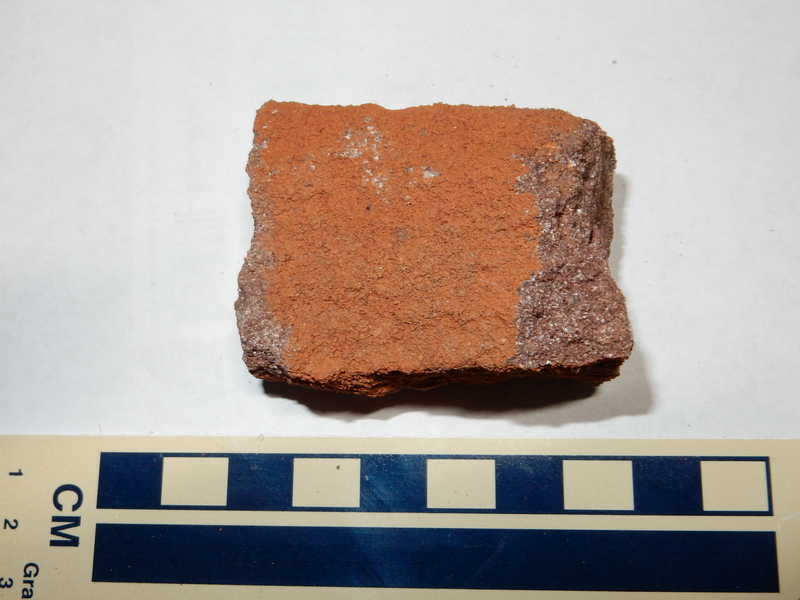 Because mudstones are mostly clay minerals, they tend to be fairly poorly indurated. Some mudstone exposures seem like little more than piles of dirt, albeit piles of dirt millions of years old. Shales also tend to be poorly indurated, but they have a very distinctive texture of thin layers. Individually the layers are well indurated, but they easily come apart, and the overall appearance of the shale is rather like a layered pastry such as baclava. 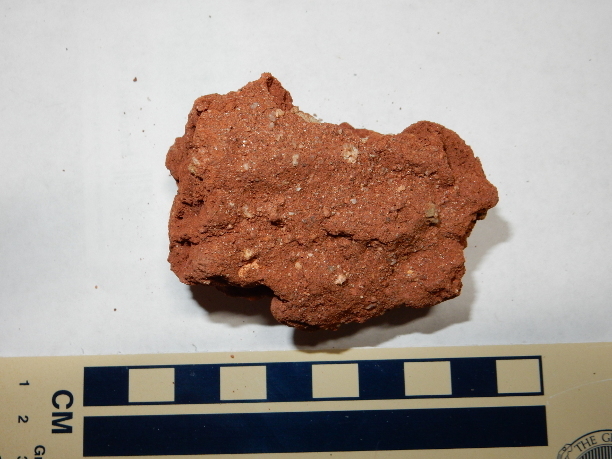 It is uncommon to come across a mudstone that is massive, solid rock, like the Arroyo del Agua Formation mudstone sample in the photograph above. Generally, such mudstone has been deeply buried, to the point where it borders on metamorphic rock, or contains an unusual abundance of fine-grained silica, or else has had an unusual amount of silica-rich groundwater circulate through it. Clays form a family of minerals related to mica. All are phyllosilicates, whose basic structure consists of sheets of silica and aluminum tetrahedrons joined to neighbors at three of their four corners. The sheets are glued to each other by metal and hydroxide ions. We saw this structure earlier. Clay minerals form from igneous or metamorphic rock that is exposed to weathering at the surface of the earth. The minerals in an igneous rock crystallized under conditions quite different than those at the earth's surface. The temperature was much higher, the pressure may have been much higher, and conditions were drier. Minerals stable under these conditions are not necessarily stable under cooler, wetter conditions. For example, potassium feldspar is susceptible to slow weathering by the traces of carbonic acid in normal surface water, which extracts potassium and silica from the feldspar to produce a clay mineral called illite. Illite is quite similar in composition and structure to muscovite, but is generally found in the form of very small flakes, distinguishable only with a powerful microscope. The composition is more variable, and X-ray diffraction shows subtle differences in the mineral structure that indicate that illite is not just very fine muscovite. 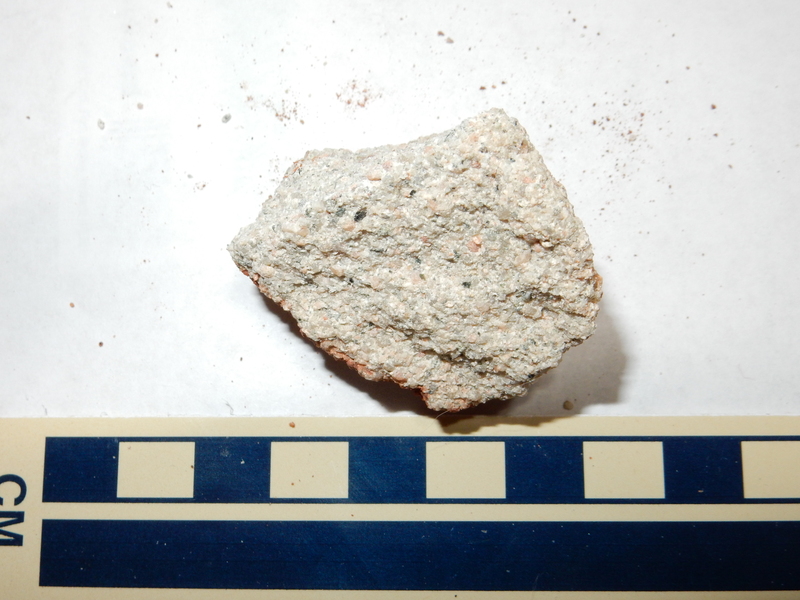 One of the first indicators of low-grade metamorphism in a clay-bearing rock is that illite begins to convert to muscovite. If weathering is intense enough, illite can further degrade into kaolinite by losing additional potassium. Kaolinite is a clay mineral characterized by a structure of a single silica sheet bonded to a sheet of alumina-hydroxyl clusters. These pairs of sheets are electrically neutral and only very weakly bonded to neighboring pairs. Plagioclase feldspar weathers to montmorillonite with the loss of silica, sodium, and calcium. Montmorillonite is a clay mineral characterized by a mica-like structure of two silica-alumina sheets joined by alumina-hydroxide clusters. This is similar to the structure of muscovite or illite, but these pairs of sheets are bound together mainly by sodium or calcium ions, rather than potassium ions. Montmorillonite varies considerably in its sodium to calcium ratio, like the plagioclase from which it forms, and shows other variations in composition. Clay rich in montmorillonite is known as bentonite and is particularly common in sediments weathered from volcanic ash. The overall effect of weathering on typical igneous rock is to convert it to clay sediments that are enriched in aluminum. These are described by geologists as pelitic sediments. When magma forms from deeply buried clay beds, such as by melting of the crust by injected basaltic magma from the mantle, the resulting magma is also enriched in aluminum. Granite formed from such magma is peraluminous and may contain unusual aluminum-rich minerals, such as corundum. Metamorphic rock formed from clay beds typically contains aluminum-rich minerals such as the aluminum silicates we saw in the last chapter. Inasmuch as I've shown you some of the northernmost exposures of the Abo Formation, it seems appropriate to show one of the southernmost exposures of the Cutler Group. This is Teakettle Rock, found near the settlement of Jarosa. I won't bother with the paleotopographic map of the Abo and Cutler beds. It's identical with the exposure map. Everywhere we find the next youngest formation, the Yeso, we find that it is either resting on Abo or Cutler beds or the lower contact is buried where we can't see it. Does this mean that there was no high ground in the Jemez area 300 million years ago? Not necessarily, because the record is always incomplete; but it appears that there was not much high ground in the area. The Jemez of the early Permian was apparently mostly rather flat river plains. Relief map of the Jemez with Yeso Group outcroppings highlighted in red. 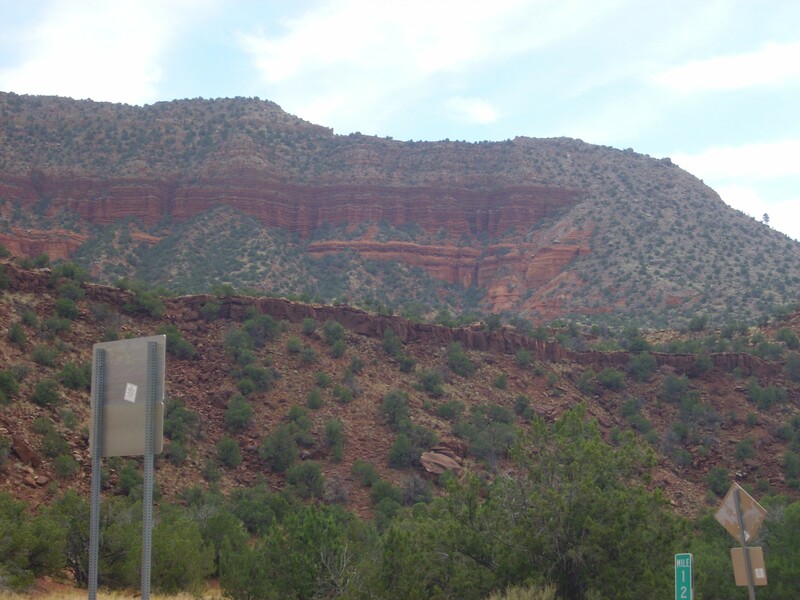 Not all the red rock in lower Cañon de San Diego is Abo Formation. 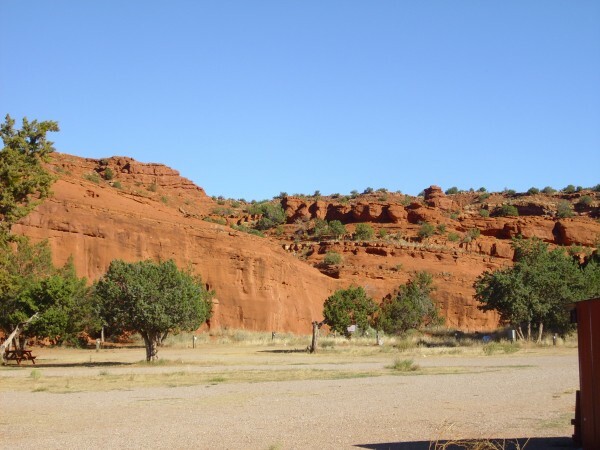 About 280 million years ago, the continuing global drying trend dried up the rivers that deposited the Abo Formation, the Permian Basin sea receded further south, and a field of sand dunes marched across the Jemez. This created the Yeso Group, which looks much like the Abo Formation from a distance. Some of the best exposures of this group are at the Red Rocks rest area just north of Jemez Pueblo. The Yeso Group is distinguished from the Abo Formation by being a less dark red, tending toward orange, and in forming thick beds of sandstone characteristic of eolian (windswept dune) deposits. This is in contrast with the thinner fluvial beds, interbedded with mudstone, of the Abo. The Yeso Group is divided into two formations, with the more massive Meseta Blanca Formation at the bottom and the thinner bedded San Ysidro Formation on top. My geological map does not make the distinction, but it looks like the two formations can be distinguished just north of Red Rocks. Under the loupe, this is seen to be a well-sorted fine sandstone of rounded quartz grains, though occasional lithic grains, with abundant hematite cement. 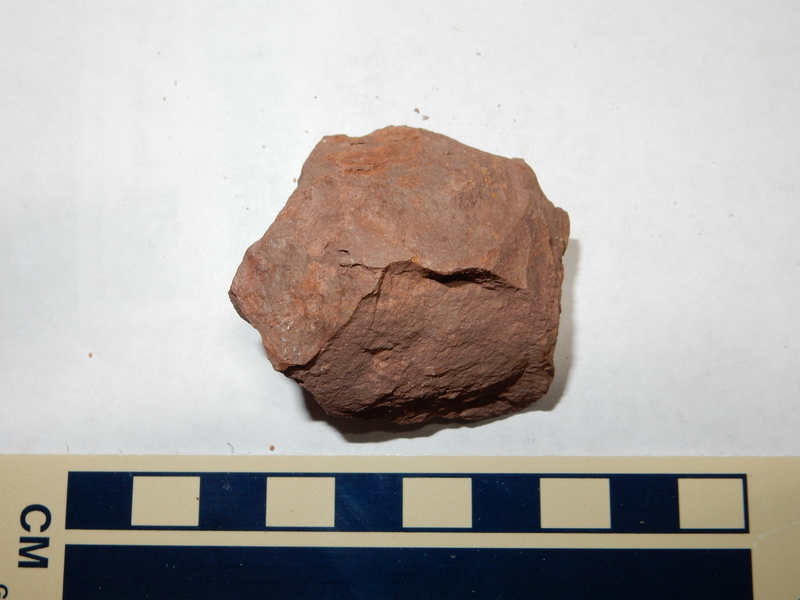 This sample was taken further north, from Forest Service land near Mesita Blanca. The sand grains of the Meseta Blanca Formation have a characteristic pitting and are described as "frosted grains." This is an indication that the grains were transported by wind at some point, during which the grains collided with each other with enough force to cause the pitting. Grains transported by water are cushioned enough by the water that they do not collide violently enough to become frosted. I have learned over the years that lighting can make a huge difference in how a rock formation appears in a photograph. I took this photograph under lighting conditions that were perfect to show cross-bedding in the Meseta Blanca Formation. Cross bedding in the Meseta Blanca Formation. Click to enlarge. Cross-bedding is where larger beds are composed of much smaller beds (cross beds) at an angle to the main beds. You can see several examples in this photograph. Cross beds are usually interpreted as showing that the beds were deposited by a moving fluid, such as a fast-flowing stream or the wind. Since the Meseta Blanca Formation is interpreted as an eolian sandstone, deposited by wind, the beds were laid down on the downwind side of dunes. This suggests the prevailing wind was from the north or northeast, which is consistent with other geological evidence that the Jemez area was located in the trade winds belt, just north of the equator, when these beds were laid down in the Permian. The Mesita Blanca Formation is correlated with the De Chelly Formation (pronounced "dee shay") that was originally mapped in Arizona. Both were deposited in the same dune sea, reaching from central Arizona through the Four Corners region to the Jemez area. The San Ysidro Formation marks a return to somewhat wetter conditions, with rivers once again depositing sediments on their way south to the Permian Basin. As with the Abo Formation, the paleotopographic map for the Yeso Group shows no instances where the next younger formation, the Glorietta Sandstone, is underlain by anything but Yeso Group. However, the Yeso Group pinches out in the northern Jemez. In other words, the Yeso Formation is thickest in the Socorro area, well to the south of the Jemez, is thinner in Cañon de San Diego, and thins to a knife edge before disappearing just south of the Coyote area. This suggests that the edge of the Yeso dune field ran through the northern Jemez. 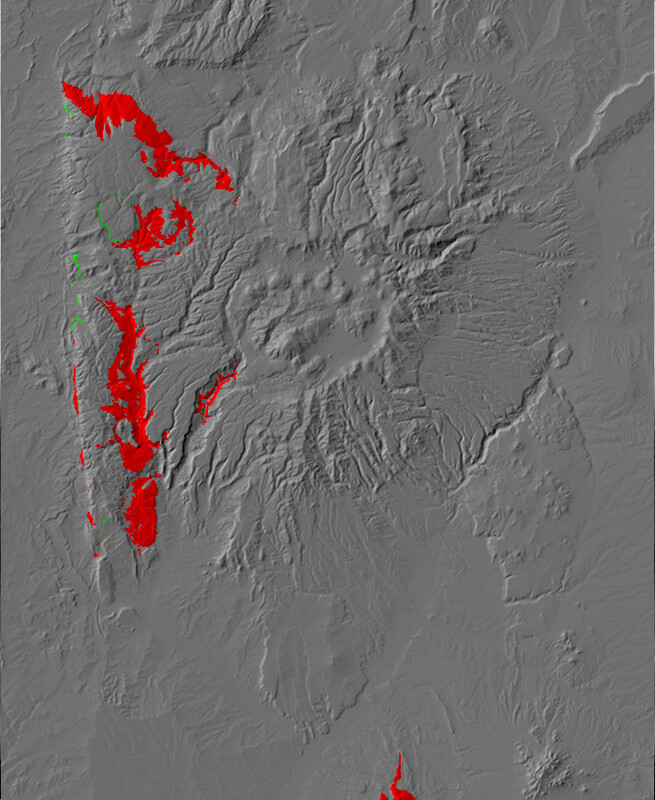 Relief map of the Jemez with Glorietta and Bernal Formation outcroppings highlighted in red. 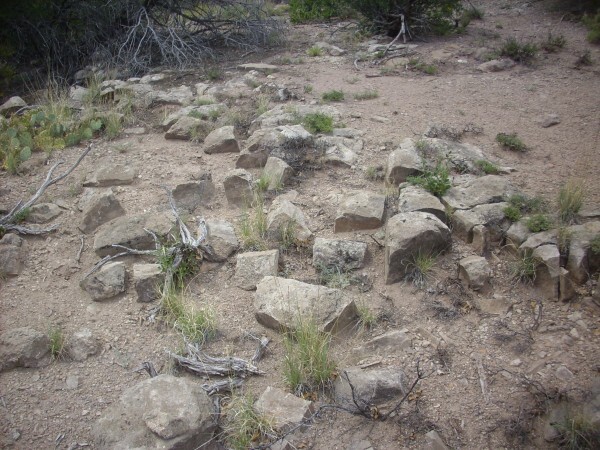 The geological report for the Jemez Springs area mentions a prominent limestone bed near the top of the San Ysidro Formation. This is visible in one of the photographs in the previous section. Above this limestone bed, the sandstone transitions to a thin sequence of more massive, whiter beds. 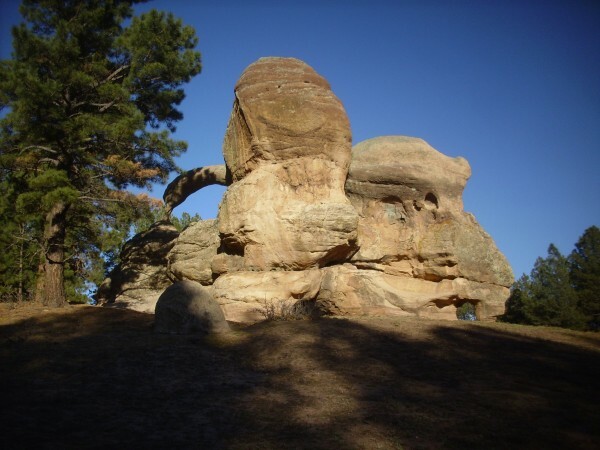 This is the Glorieta Sandstone, which was deposited beginning about 275 million years ago. The Glorieta Sandstone marks the return of the shallow sea to this area, since it has the characteristics of sandstone laid down in a beach environment. Looking northwest from this location, we see what is apparently the furthest southwest remaining outcrop of Bandelier Tuff. The mesa on which this Bandelier Tuff ridge sits is called Meseta Blanca, probably because of the whiter color of the Glorietta Sandstone capping the mesa compared with the red formations underneath. There is a thin bed of Triassic Chinle Group under the Bandelier Tuff, mostly buried under talus; we'll have more to say about the Chinle Group later on. You can see the transition to redder Yeso Group sandstones with that characteristic white limestone bed halfway down the side of the mesa. A (not very good) road climbs the bench in the foreground from the village of Canon and ascends Meseta Blanca. However, the road becomes all but impassable where it crosses a fault that brings dark red Abo Formation alongside orange Yeso Formation. The dark red Abo Formation beds in the foreground abruptly give way to more orange beds of the Yeso Group. Here's a closer view of the whitish patch in the road on the other side of the fault trace. The white discoloration is likely from ground water seeping from the fault. The rock beds in the road bed are so deeply gullied that vehicular travel further along the road would require great care even with an off-road vehicle, though the tire tracks show someone did so since the last rain. The road up the side of the mesa has been blocked with an iron gate; the adventurous geologist must travel beyond by foot. Further up, there is no ambiguity about the formation assignment. 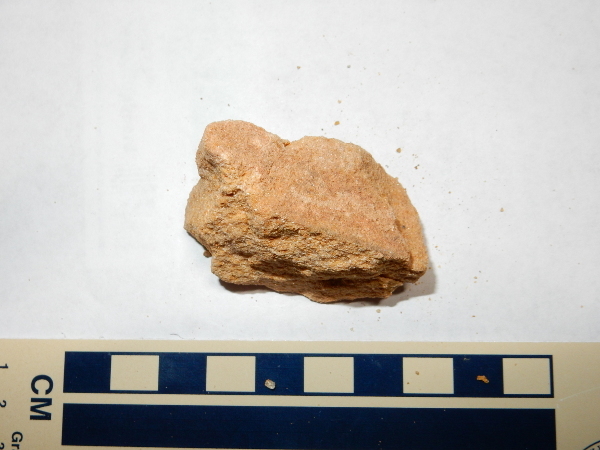 Under the loupe, this is found to be a moderately well sorted medium sandstone of somewhat angular quartz grains with ample pore space that appears to be cemented with silica. The Glorietta Sandstone is prominent in the Glorietta Pass southeast of Santa Fe, from which the formation takes its name. It is correlated with the Coconino Sandstone of northern Arizona, both formations being laid down in a dune sea covering most of northern Arizona and New Mexico. 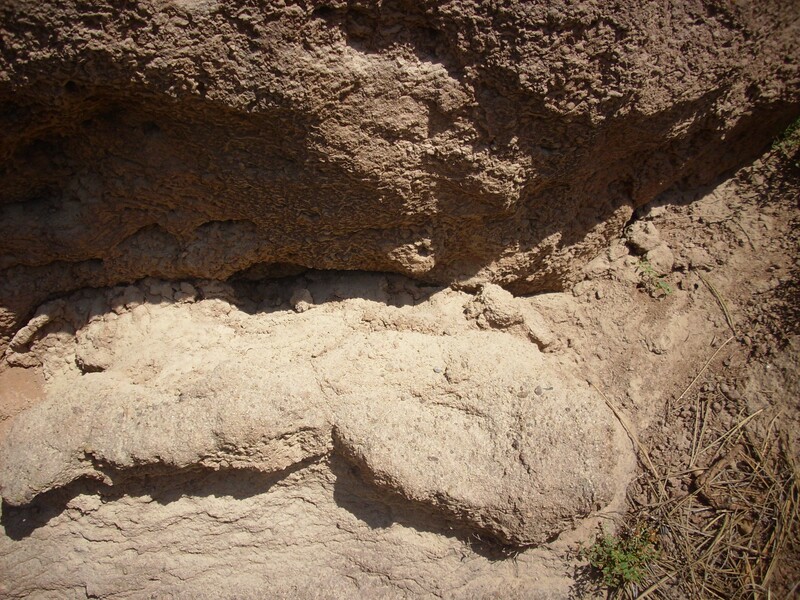 Another fine exposure of most of the Permian column is found at Mesa de las Casas. While not easily reached for close inspection, it has the merit of being easily viewed from State Road 4. The foreground ridge is underlain by the Abo Formation. The sides of the mesa, working upwards, are Mesita Blanca Formation, Yeso Group (the thick, lighter beds at the base); San Ysidro Formation, Yeso Group (the thinner red beds above); Glorieta Sandstone (the lighter beds near the mesa top); Triassic Moenkopi Formation (at the very top of the mesa and under the knoll); and the knoll itself, underlain byTriassic Shinarump Formation, which we'll learn about in the next chapter. The same sequence is exposed on Mesa Chuchilla. Mesa Chuchilla is just left of center, and is capped by Tertiary Shinarump Conglomerate and Moenkopi Formation overlying Permian beds. At left, the beds plunge below the surface, and younger Jurassic beds cap White Mesa. At right, in the middle distance, is Hard Rock Ridge, capped with more Shinarump Formation, and on the skyline is Pajarito Peak, underlain by Precambrian metamorphic rocks. Mesa Chuchilla is the east side of a downwarped plateau capped with Shinarump Formation; the west side of the plateau is Red Mesa, which also exposes this sequence of formations. By the end of the Permian, which is the final period of the Paleozoic, the supercontinent of Pangaea was nearly fully assembled. 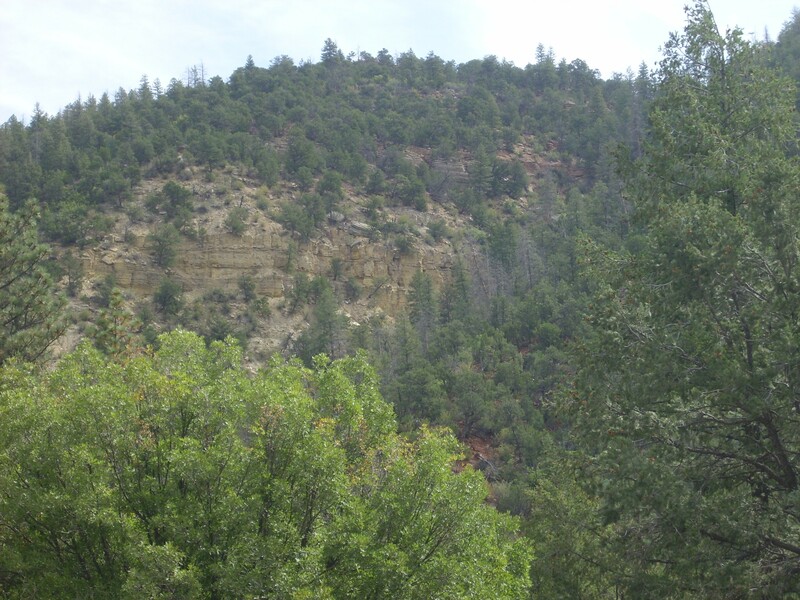 As a result, the Mesozoic would be a period of relative tectonic quiescence in the Jemez area. The uppermost Permian and lowermost Triassic beds are missing from the geological record in the Jemez. This must have been a period when the oceans had receded far enough from northern New Mexico to permit significant erosion. As a result, there is no direct record in the Jemez of one of the greatest catastrophes in the history of the Earth. Next page: The age of the dinosaurs in the Jemez. Copyright ©2014-2015 Kent G. Budge. All rights reserved.